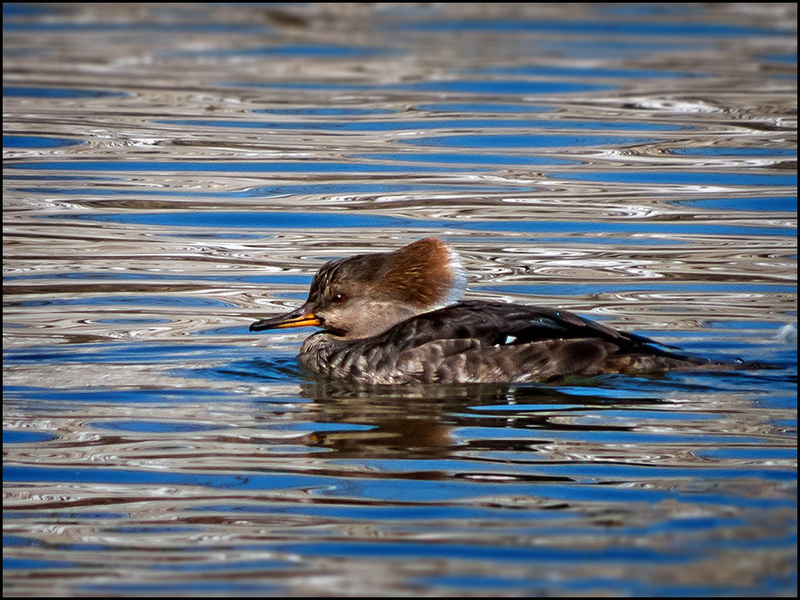 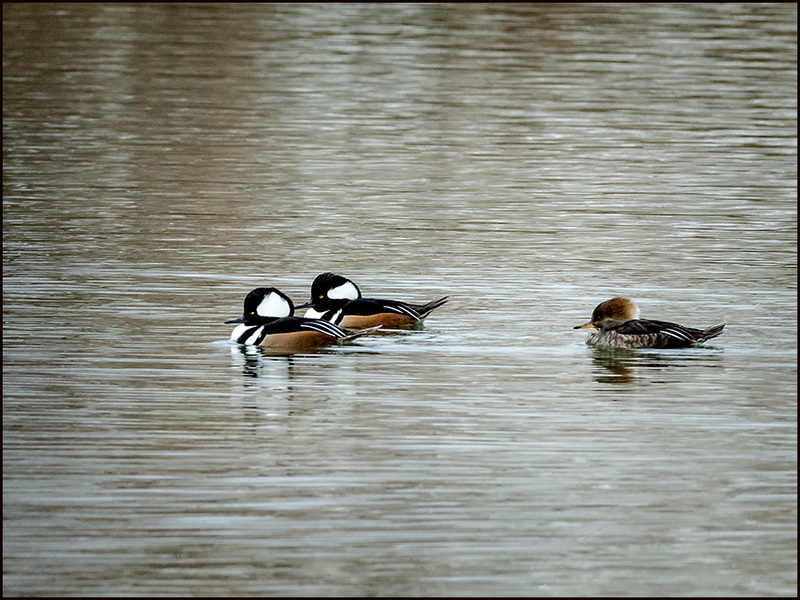 For the 3rd straight year in a row, I have found Hooded Mergansers at the same location! 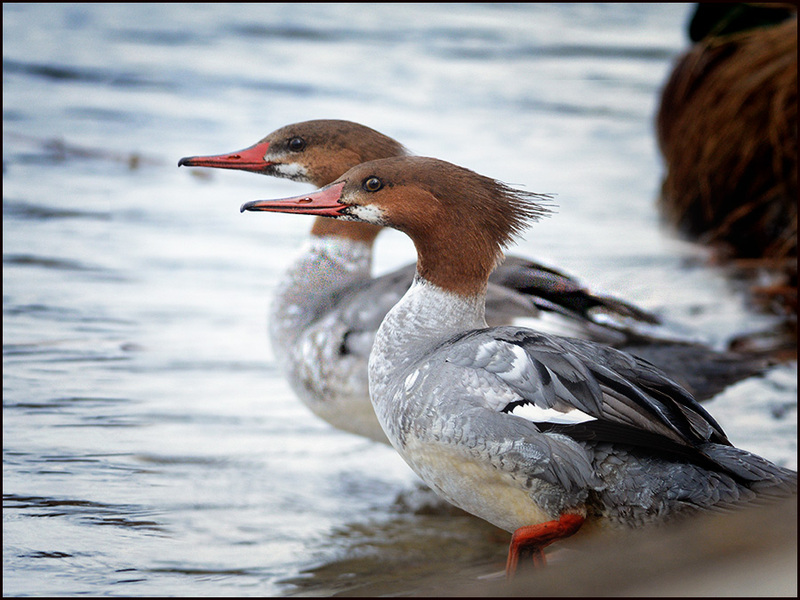 This year there are at least 4 adult pairs, along with a sizeable number of 1st Year birds! 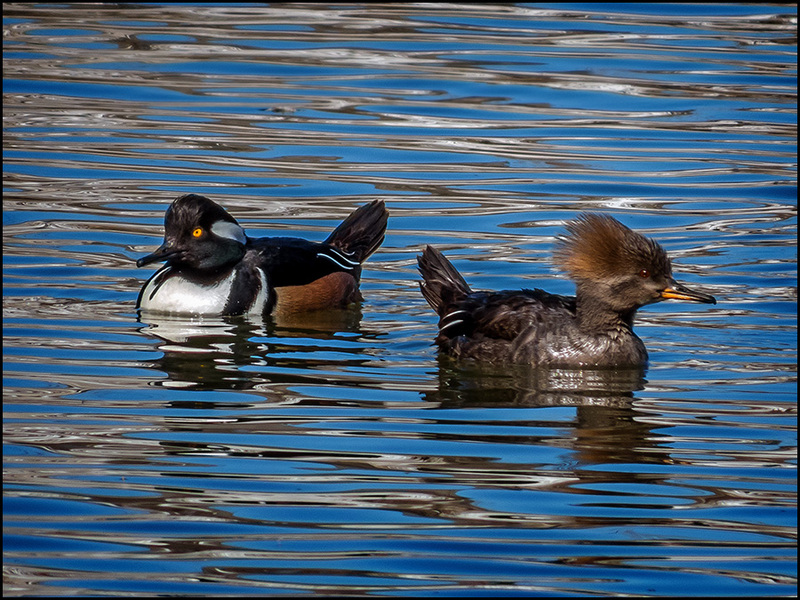 The 2 birds forward are 1st Spring males; with an adult pair bringing up the rear. 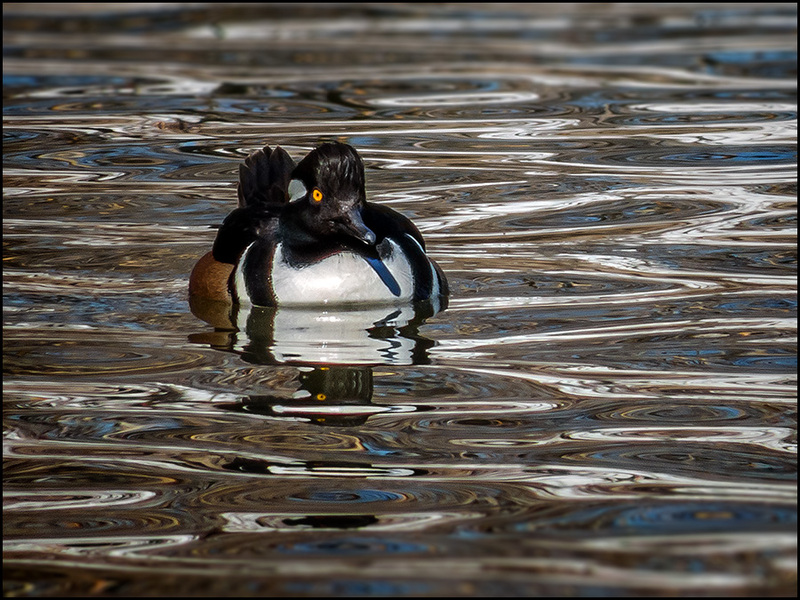 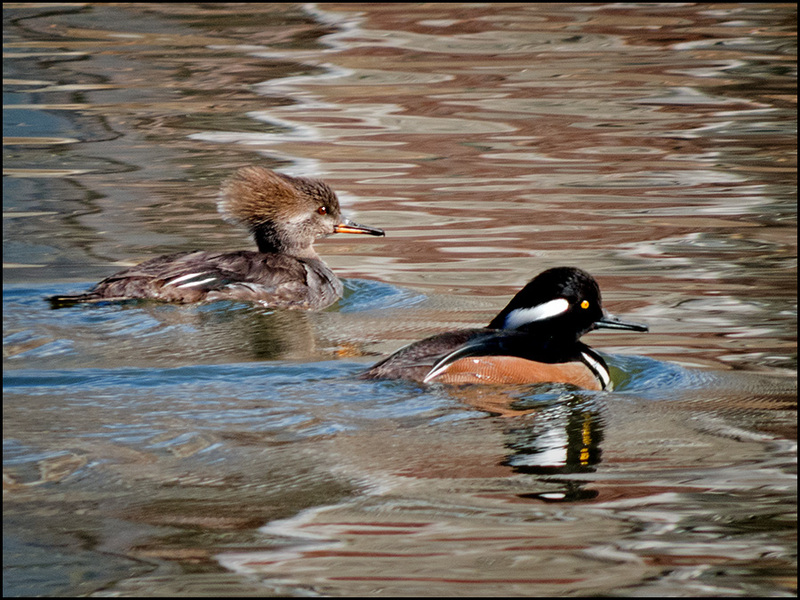 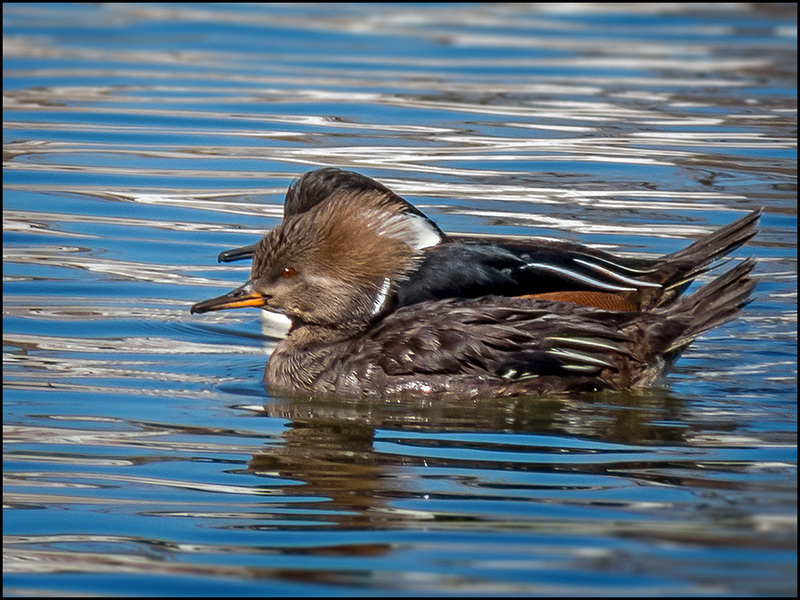 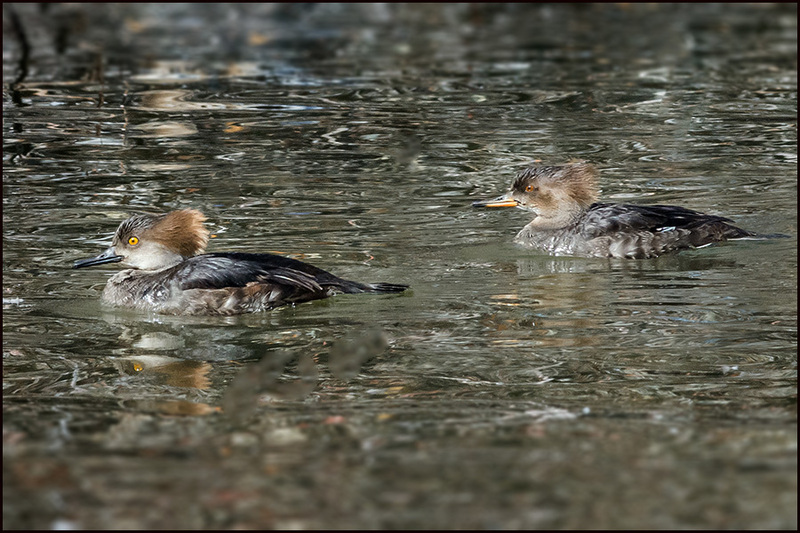 Here are 2 First-Spring Male Hooded Mergansers, defined by their black bills and eye coloration! 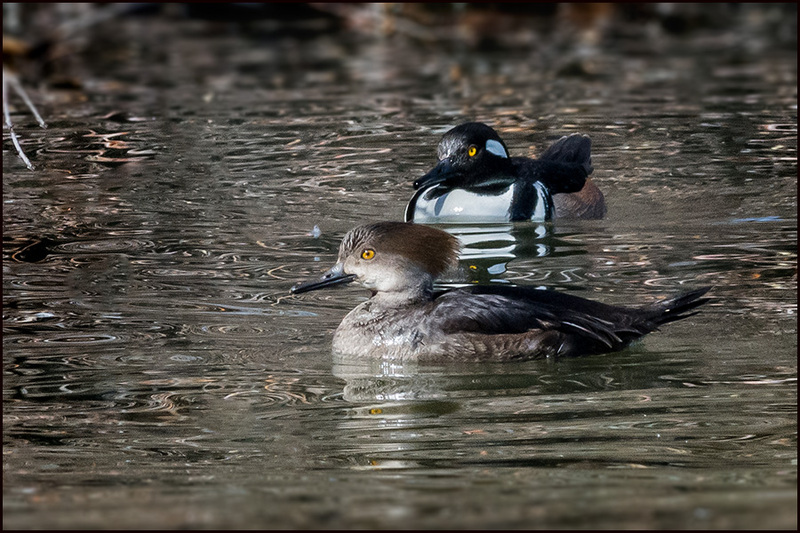 Here we see a 1st Spring Male, with a Female behind him... notice her eye coloring and yellow bill in contrast to the male's eye color and black bill. 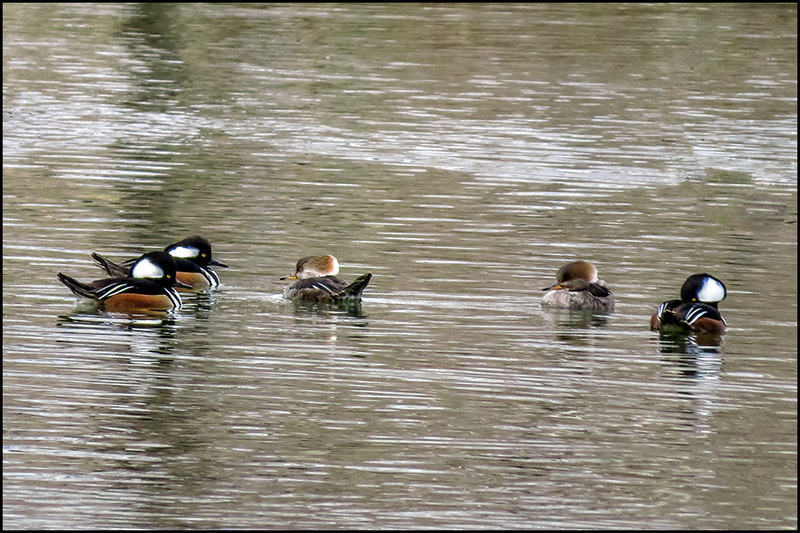 While photographing these birds I decided to employ the tiny Canon SX50 camera for awhile on a day with overcast sky; and another with bright sun. 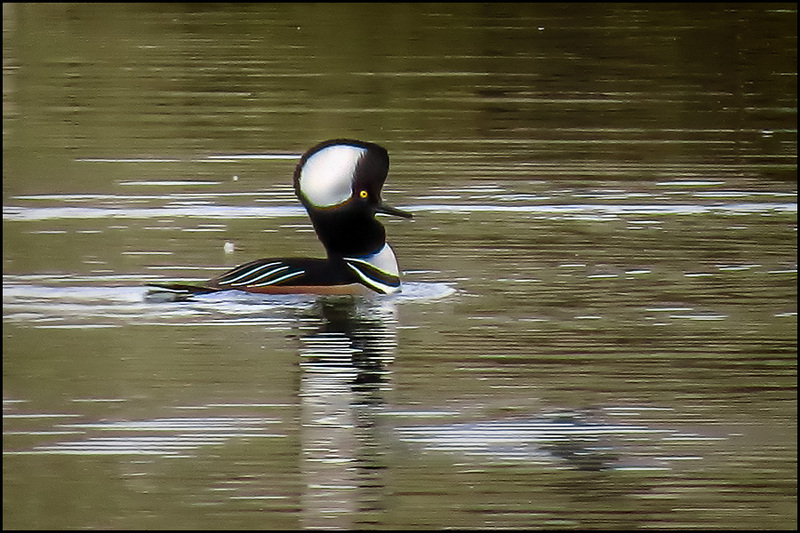 The sunny images always work best with this camera, although the flat lighting from overcast skies sometimes provide a 'painterly' outcome. 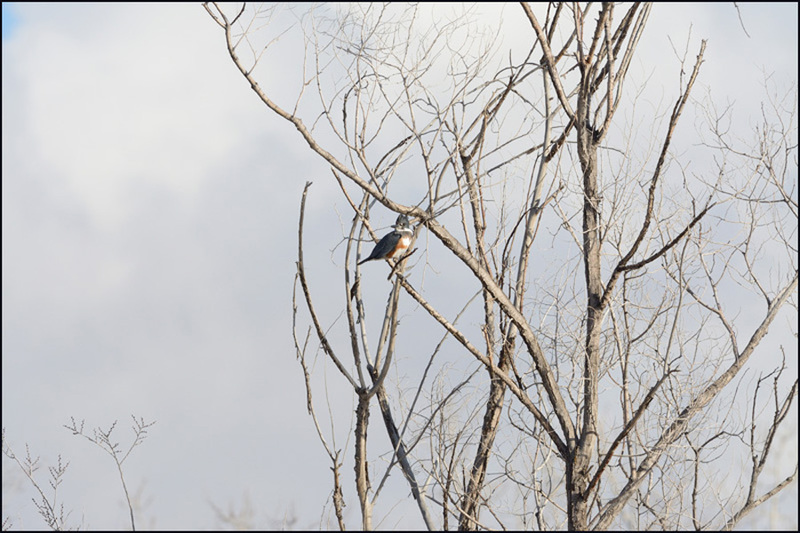 Direct sunlight works better than overcast with this camera. 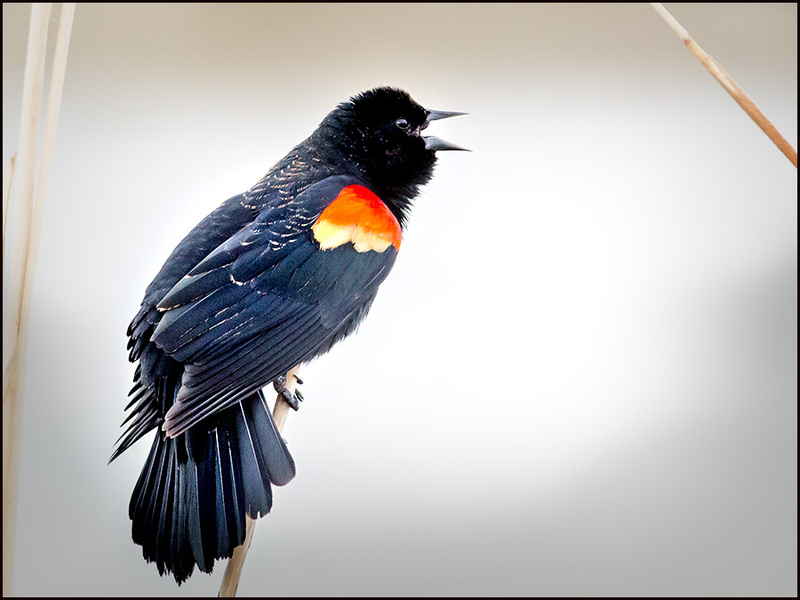 Springtime is just around the corner, announces the male Red-Wing Blackbird! 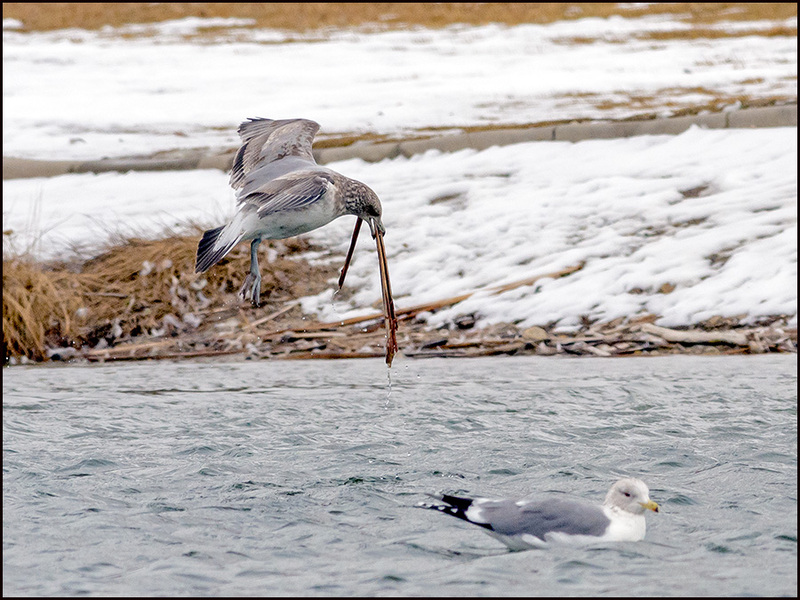 The bird did not dive, rather, he scouted for small fishes this way. 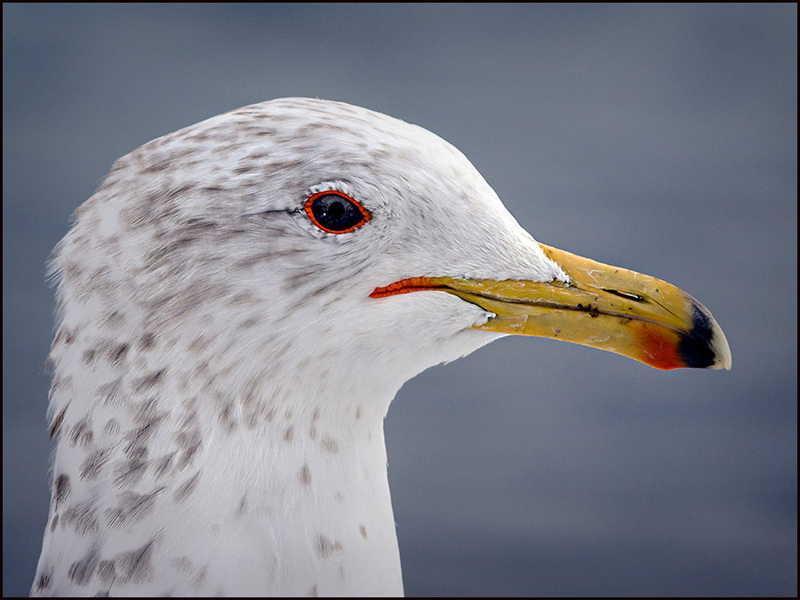 He looked normal until he shifted directions, revealing his loss. 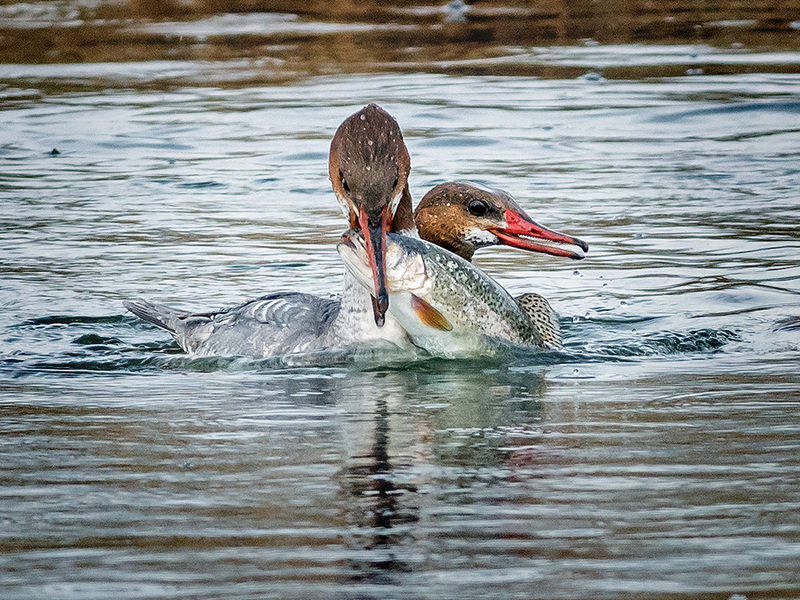 The bird stopped fishing and began to preen. 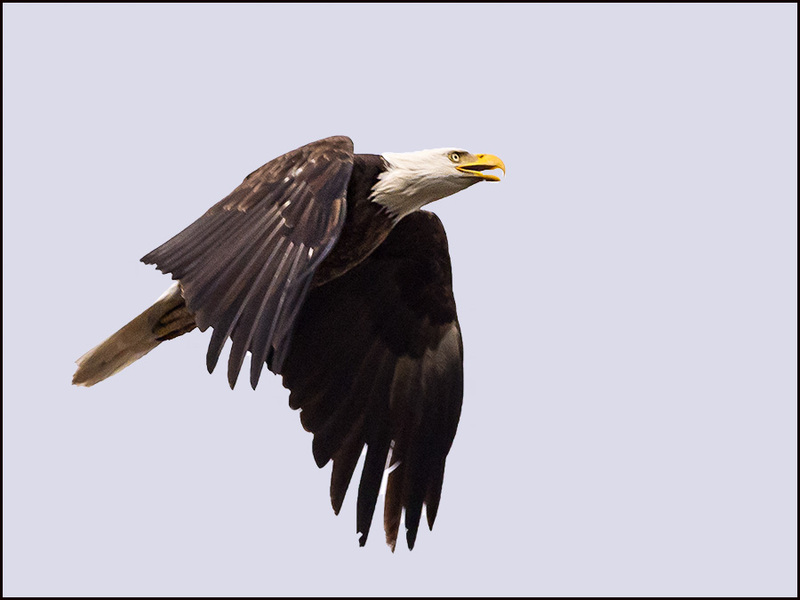 In doing so, his stump of a leg began to move rapidly as if it was connected to a foot! 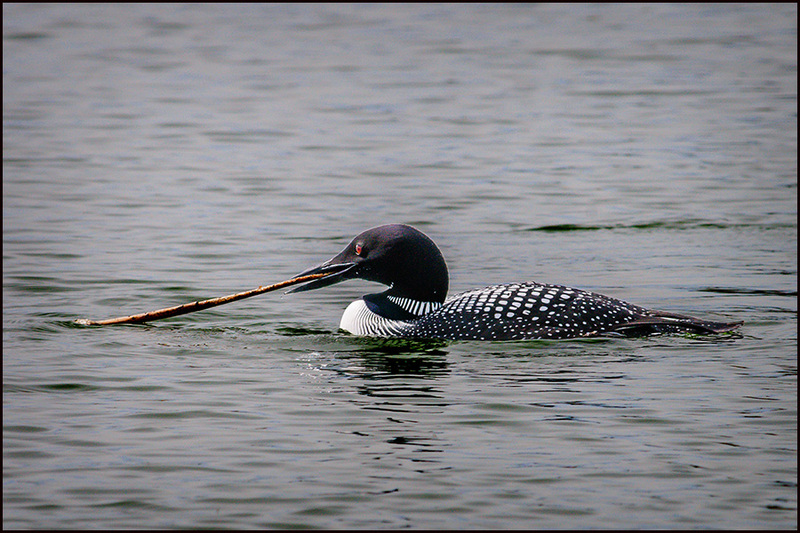 The bird has adapted marvelously to his handicap! 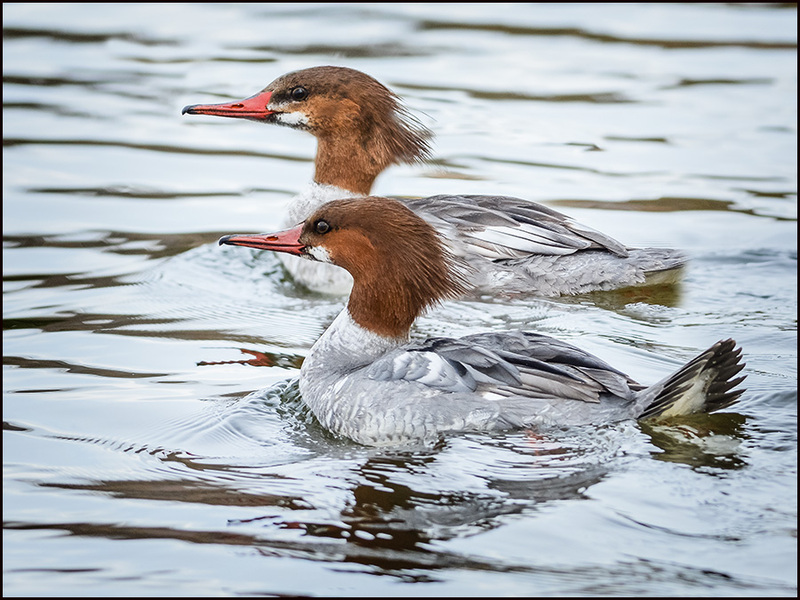 Compare the behavior of a normal female Cansvasback, doing the same thing! 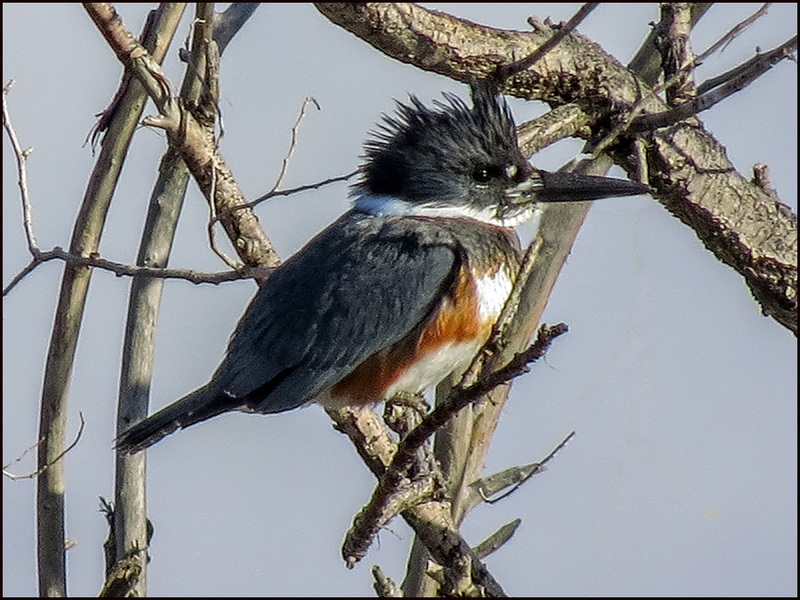 This bird can preen and scratch with ease. 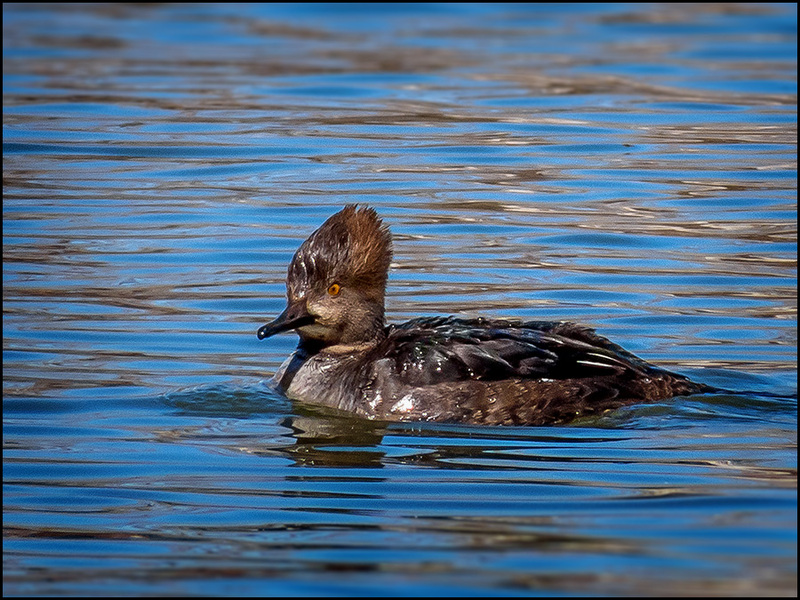 I've posted earlier (below) regarding interesting birds/activities at Willow Pond, Murray, UT. 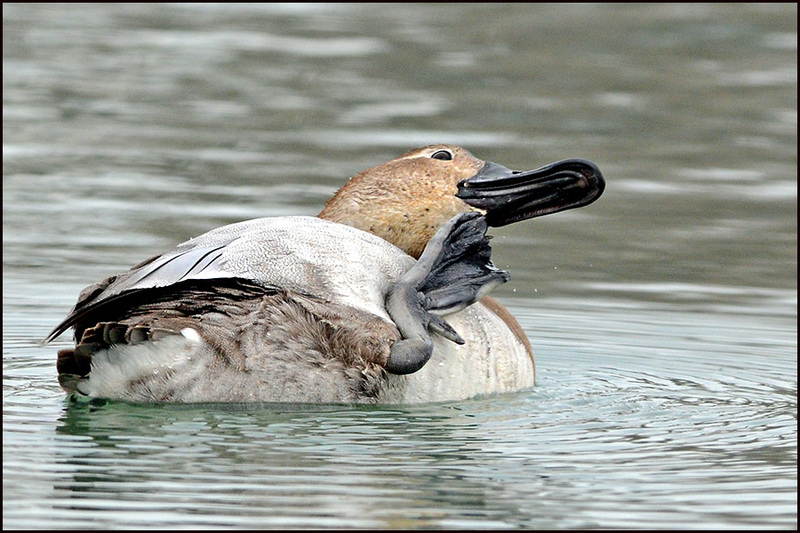 But this year compared to last year is dismal with far fewer species! 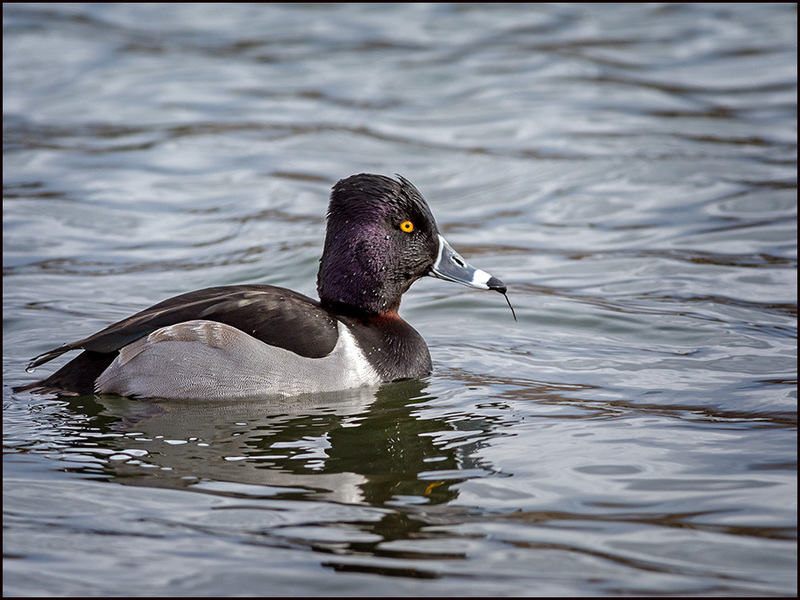 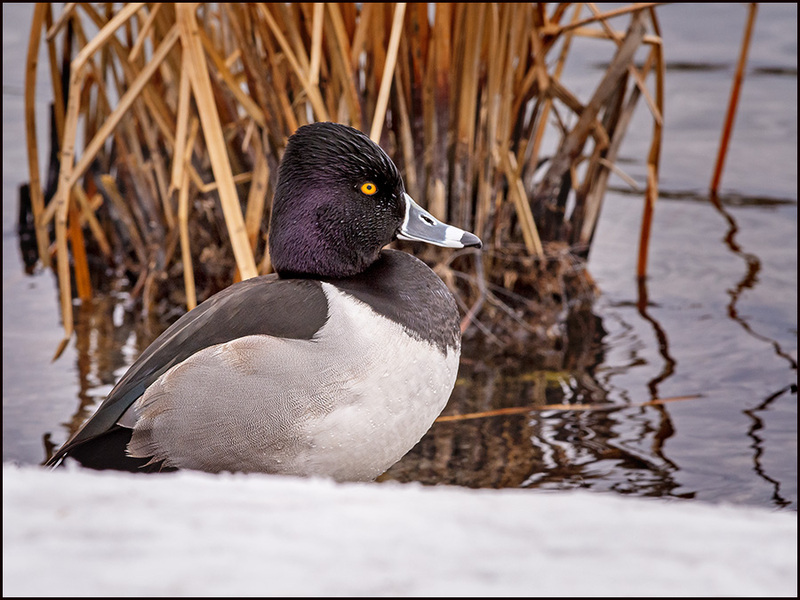 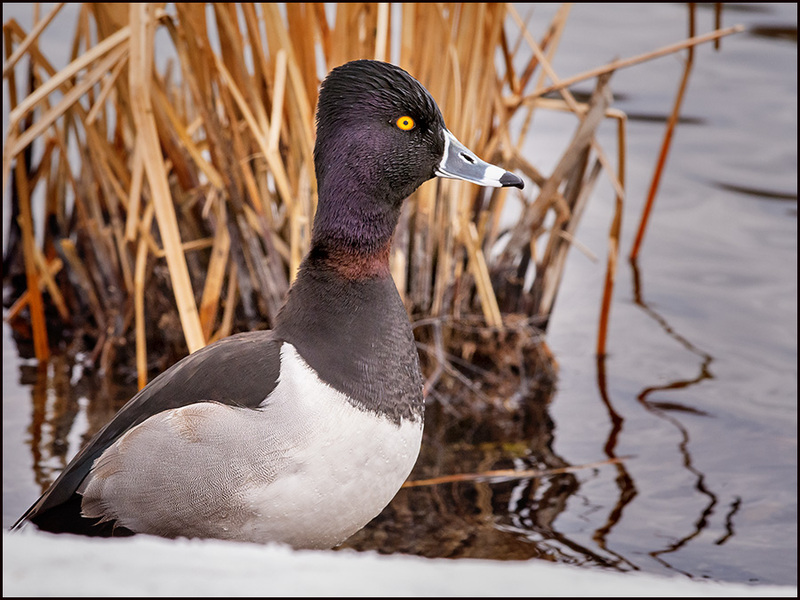 A lone male Ring-necked Duck that shows a tiny fraction of its chestnut colored ring, or collar. 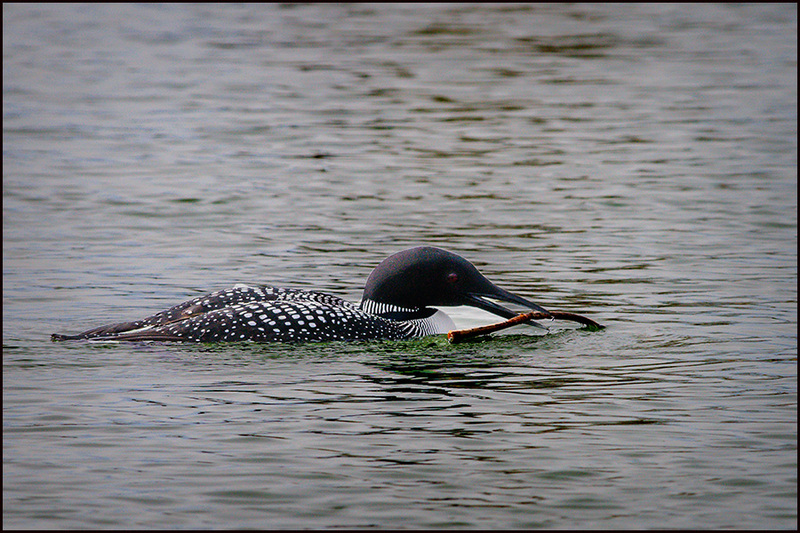 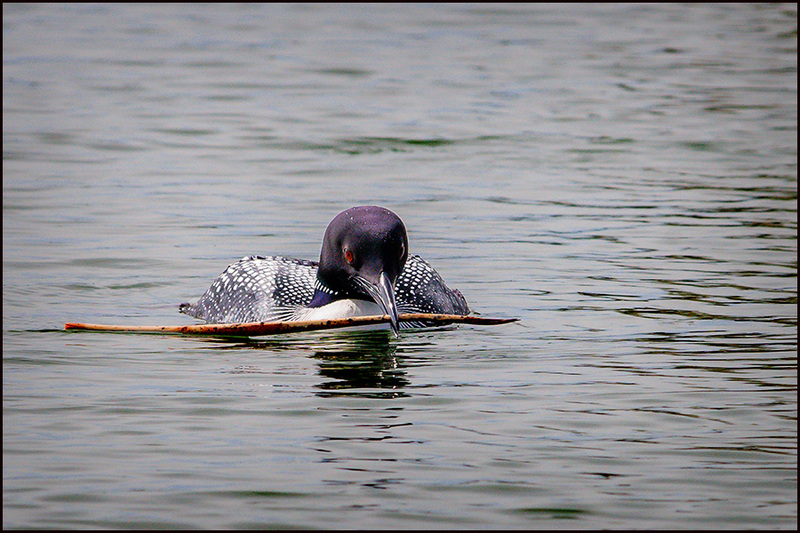 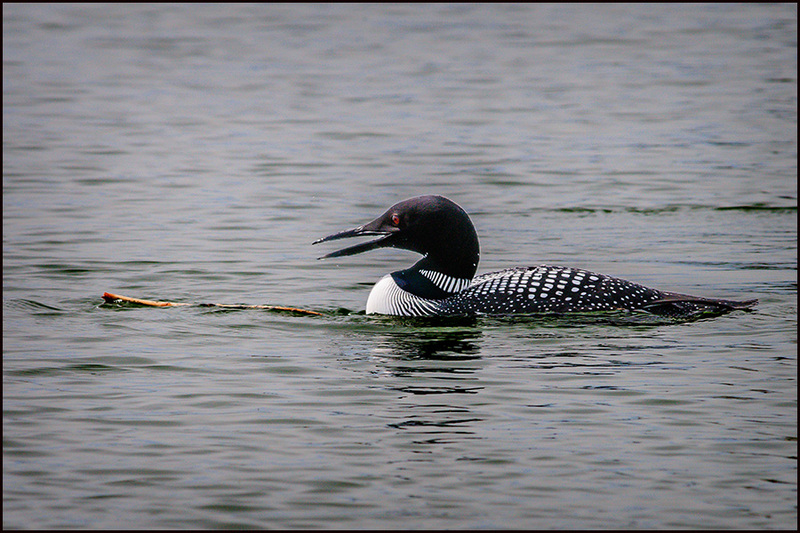 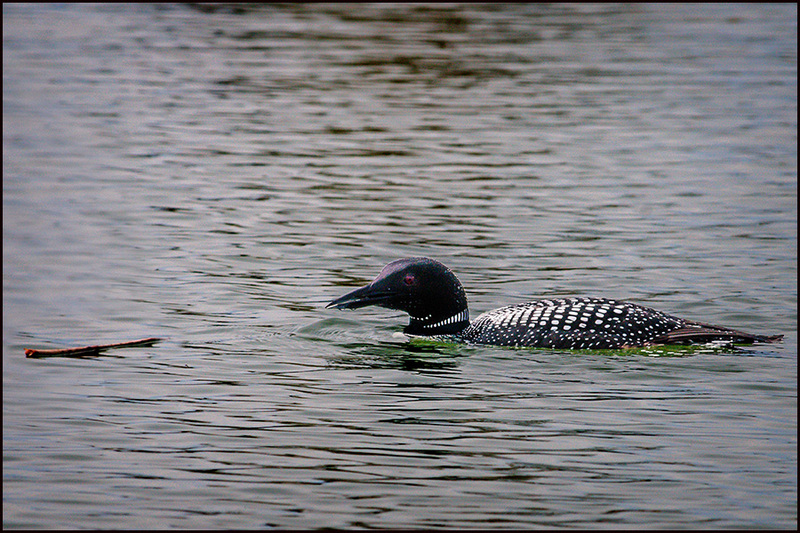 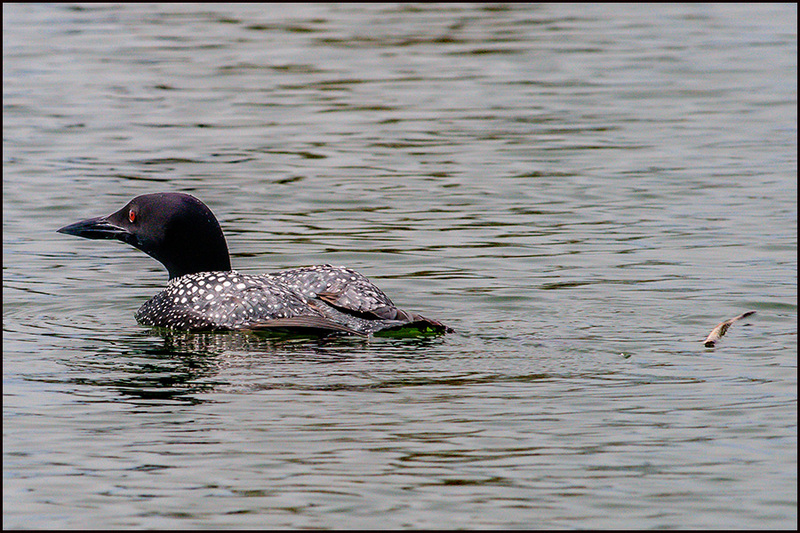 Here is one out of the water, relaxing, with no hint of its ring-neck pattern. 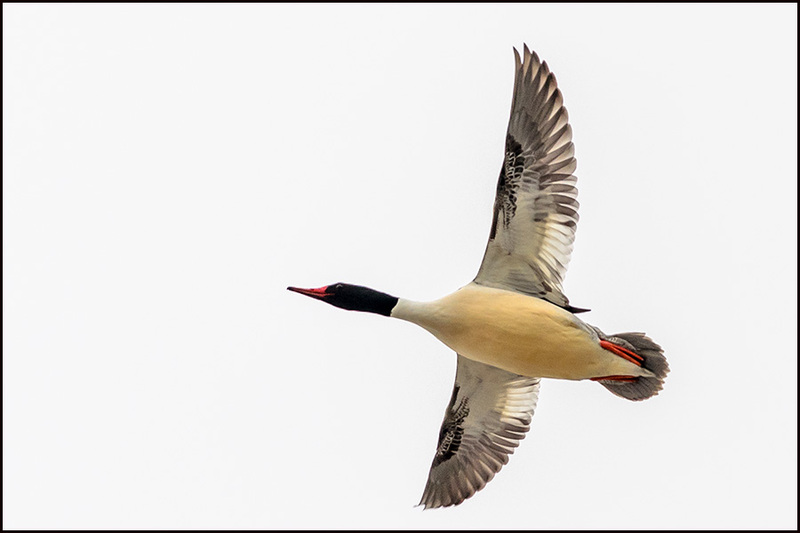 This bird was flying south, directly over the pond. 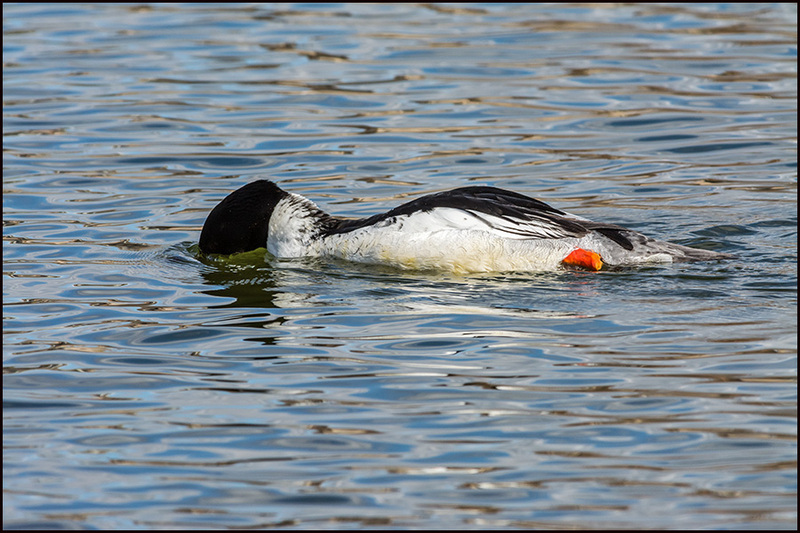 I've seen as many as 6 birds doing this. 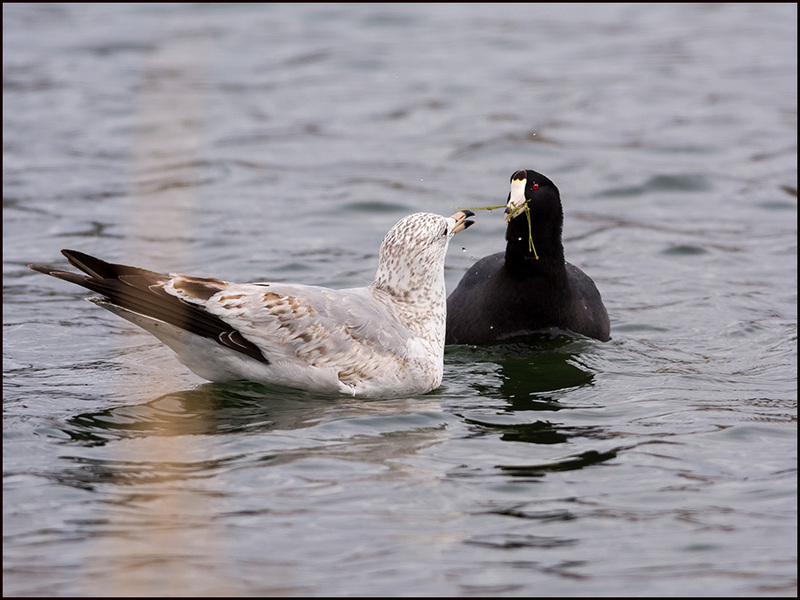 An extreme closeup of a Ring-billed Gull, trying to steal a Coot's 'salad'! 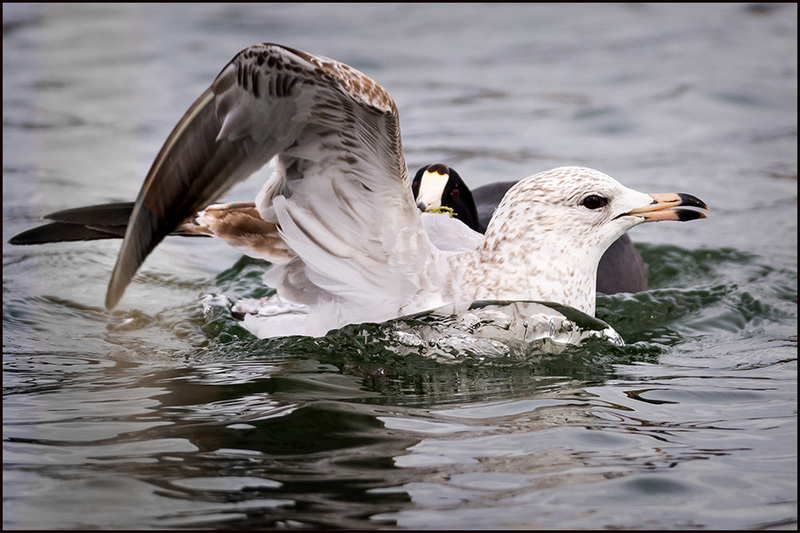 It didn't go very well for the gull!! 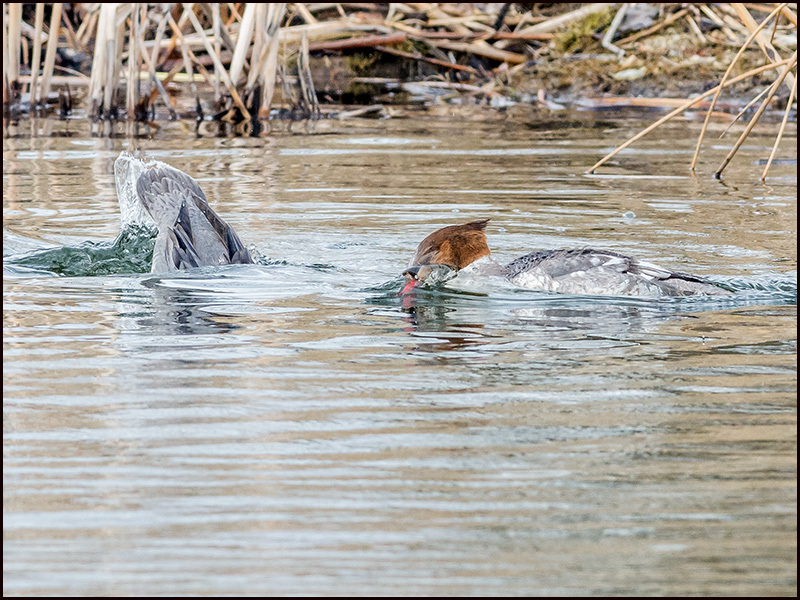 Things got heated up in a hurry! 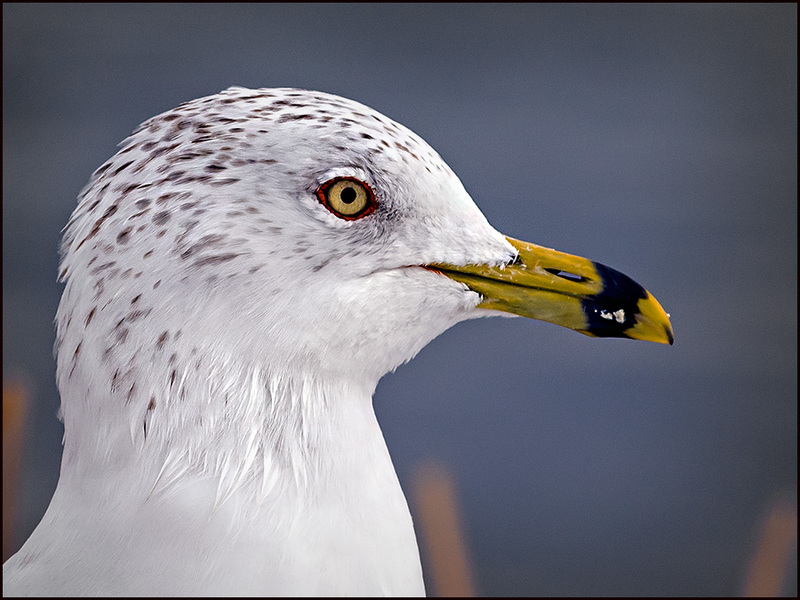 with the Gull "taking the short end of the stick"
I also took advantage of a close encounter with a California gull to do the same! 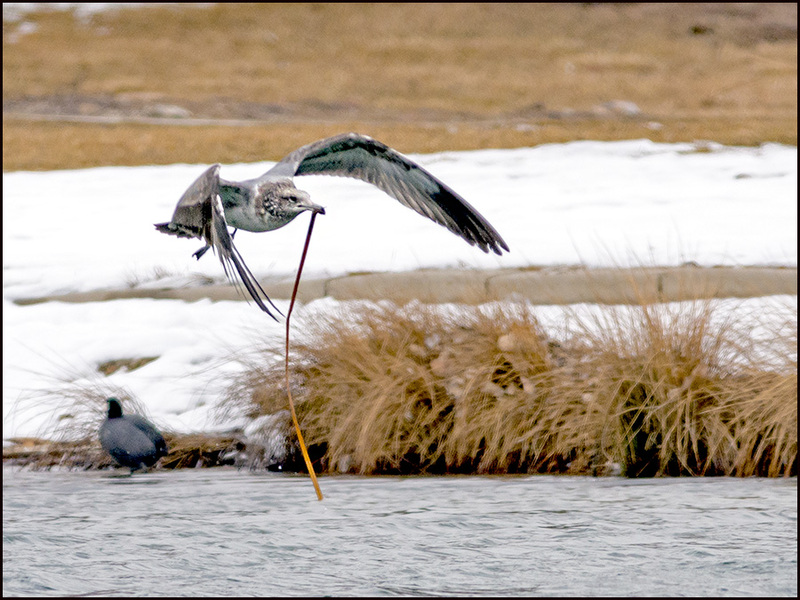 Gulls were playing with sticks they were picking up from the pond!! 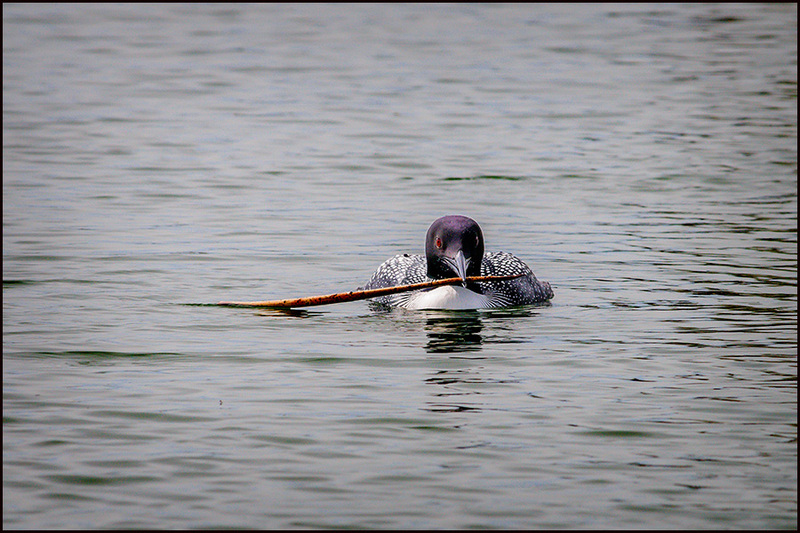 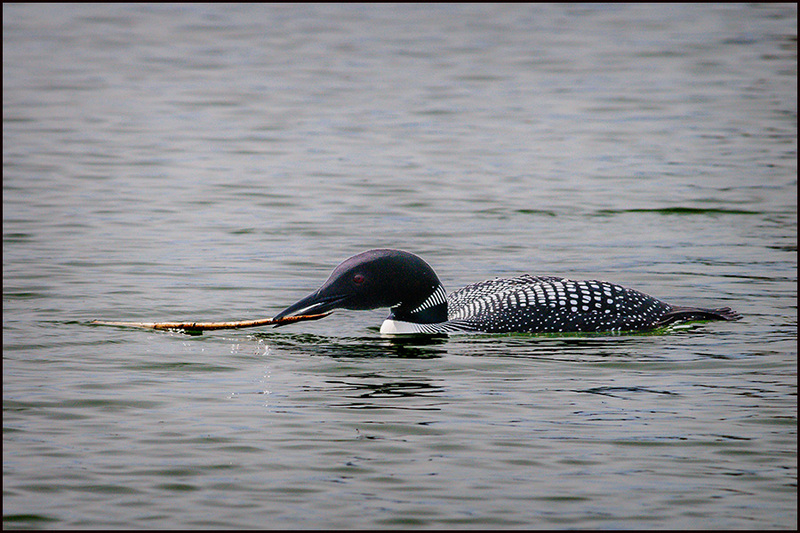 And that reminded me of another bird I discovered at Willow Pond in an earlier year that 'played' with a stick! 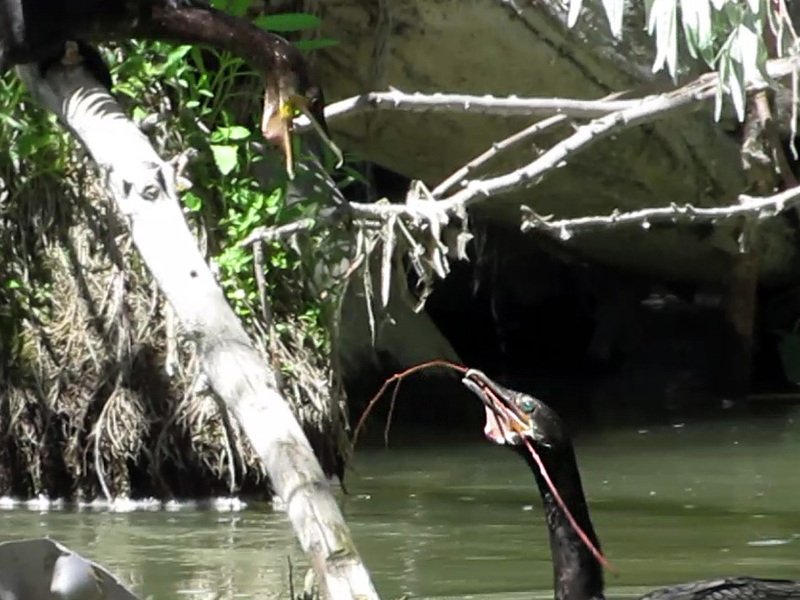 Finally, earlier, I shot Neotropic Cormorants playing a stick game on the Jordan River, adjacent to Mill Race Pond in Taylorsville. 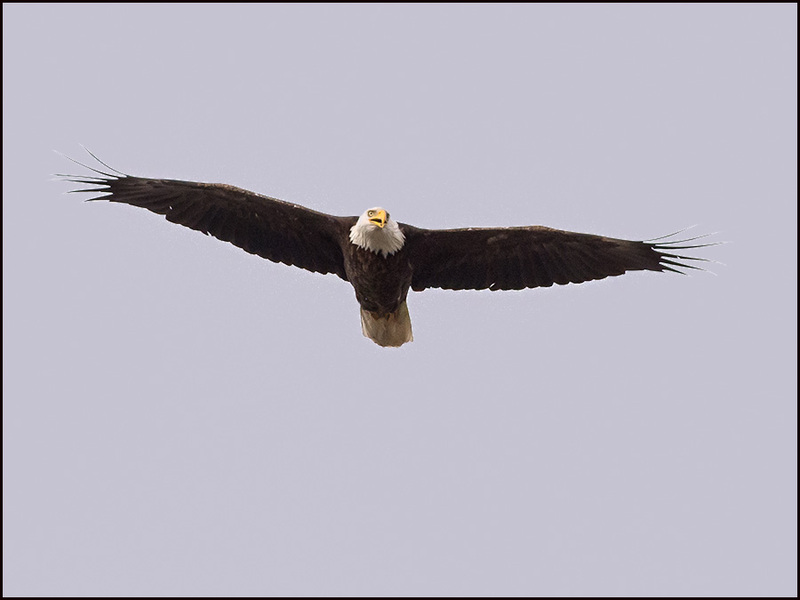 Click on the image below and watch several NECOs passing the stick around! 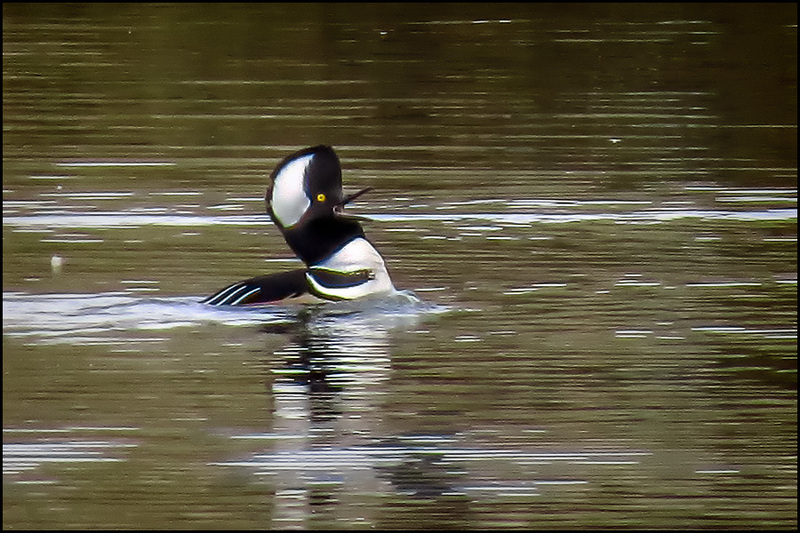 Allow a few moments for the video to appear... less than a minute. 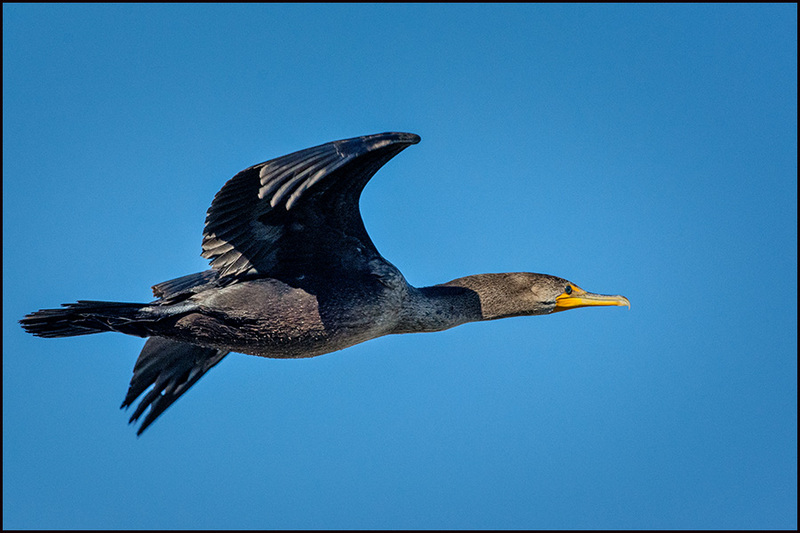 In the above 'screengrab', a distinctive characteristic of Neotropic Cormorants is evident... a PINK gular sac, which separates them from Double-Crested Cormorants (along with size differences). 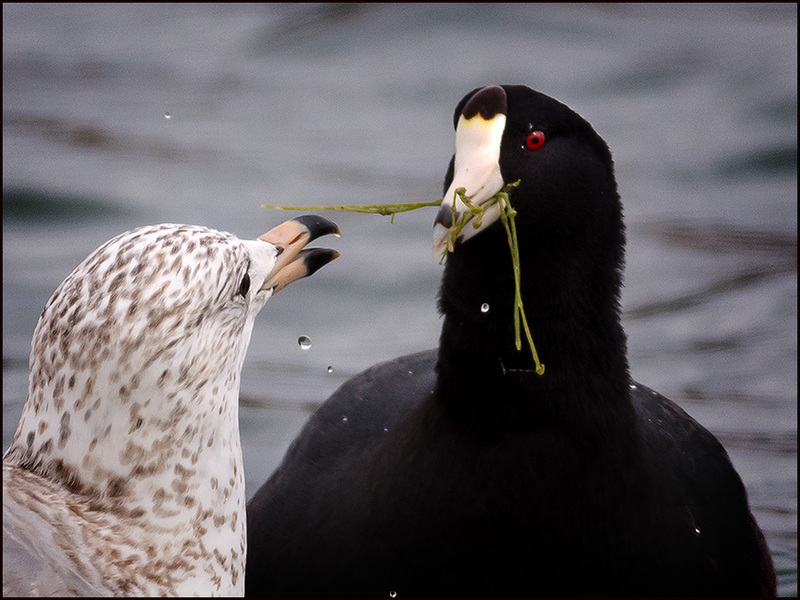 Watch closely in the video to see these birds display their sacs in 'social signaling'. 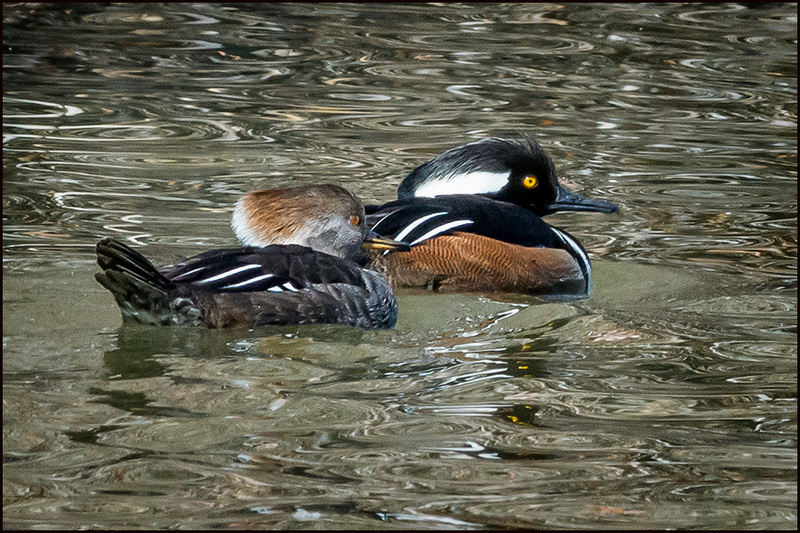 Finally, compare my image from 2013 (MillRace Pond) showing both species displaying their distinctive sacs (Neco-pink/DCCO-yellow) during 'gular panting'... a method of thermo-regulation in these birds. 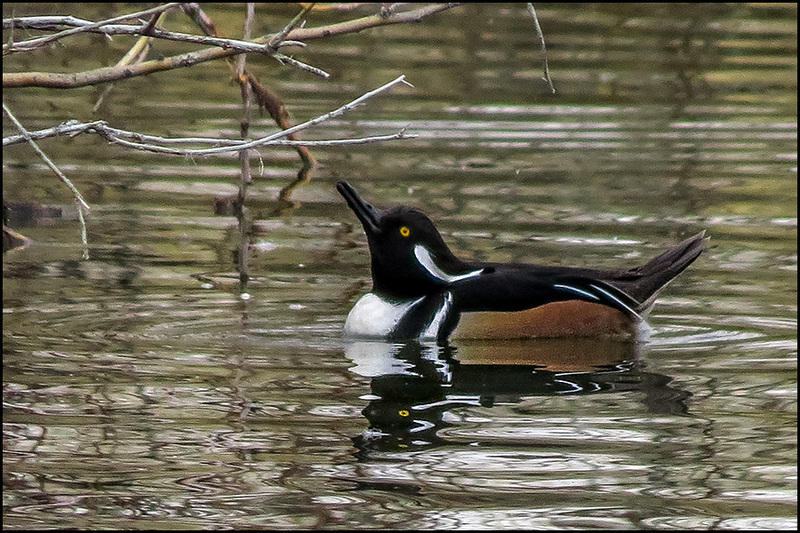 At the time I photographed images for my Feb 14 post, I also doubled shooting some images with my tiny Canon SX50 Point & Shoot camera, then promptly forgot about them! 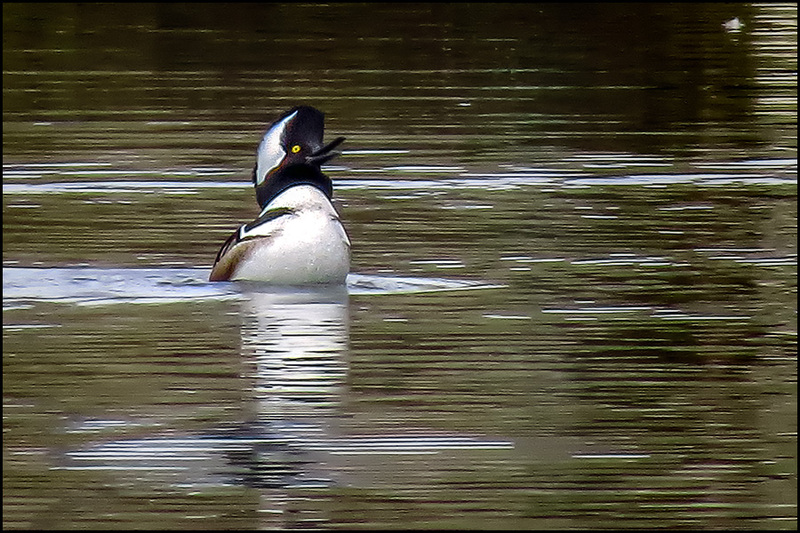 Finally remembering them, I came away duly impressed by what the camera, which now sells for 1/7 of the price of my Nikon setup, produced! 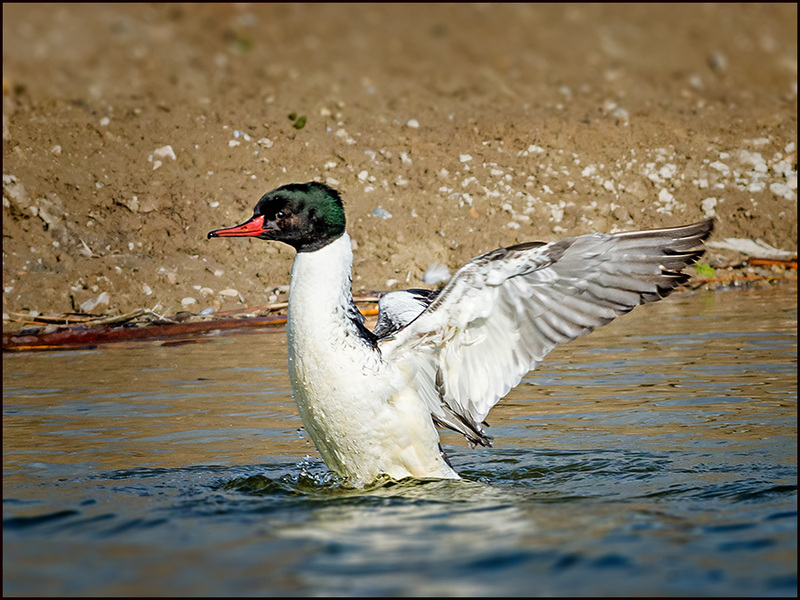 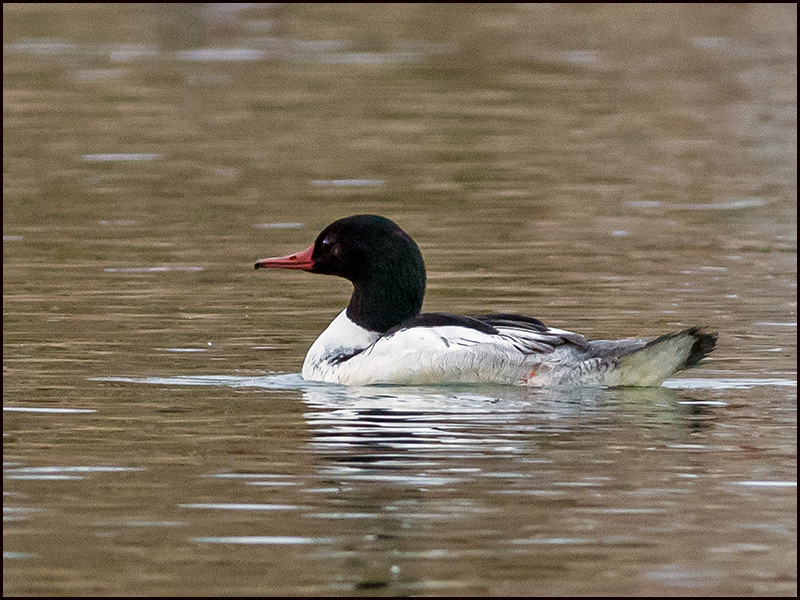 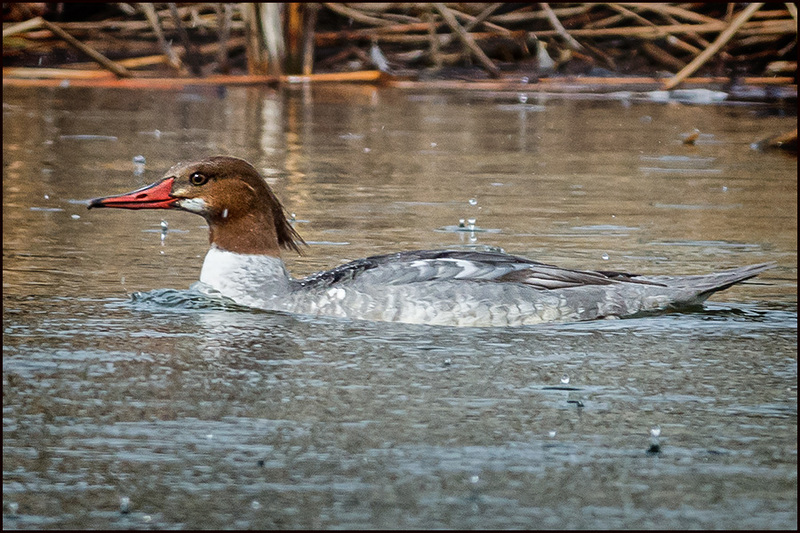 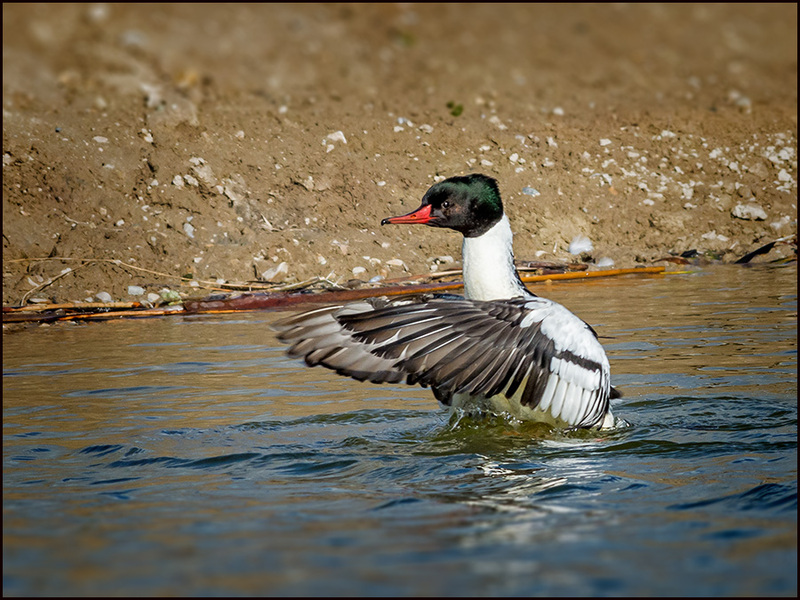 Male Common Merganser (missing a leg!). 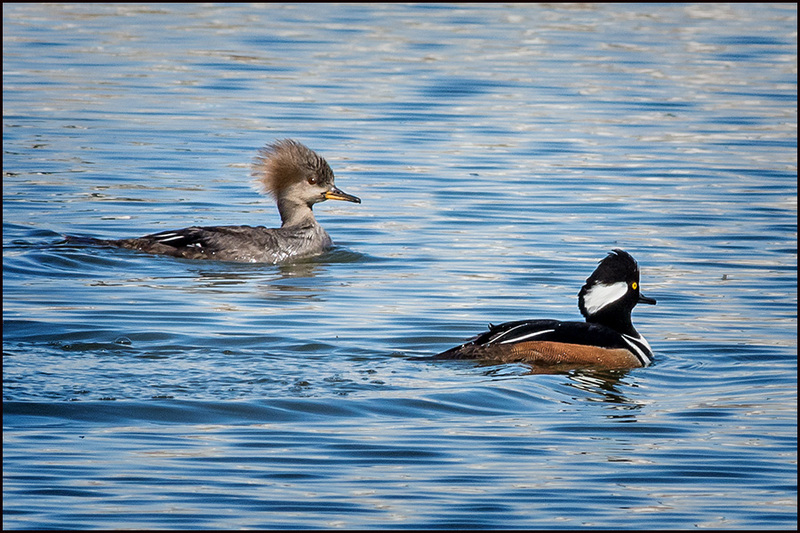 Below is a comparison between the Nikon D5200, 300mm lens with 1.4 teleconverter (DX crop factor=630mm) Price: approx. 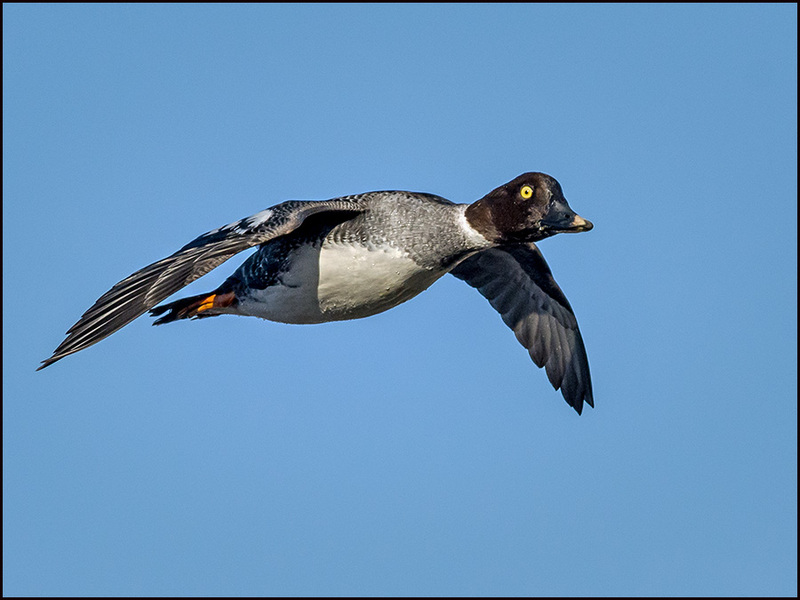 $2,500. 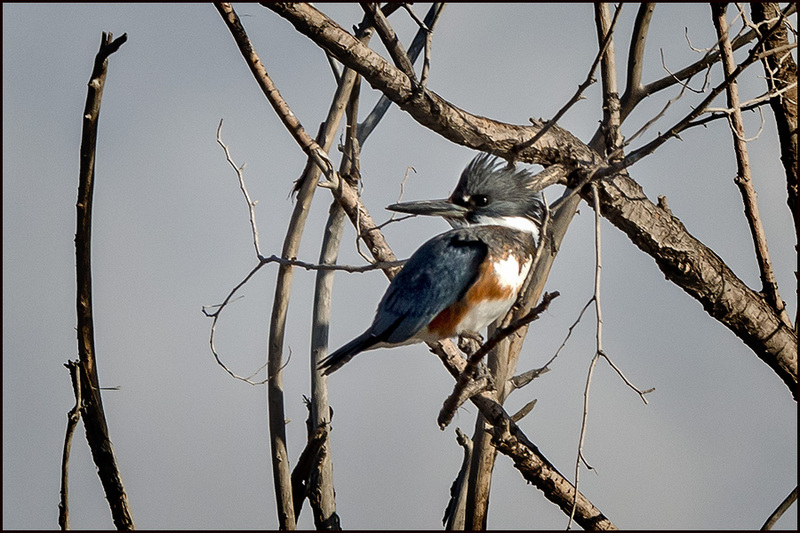 Now, to the Canon SX50, set to "200% in-camera digital magnification" for an outcome of approximately 50X magnification directly from camera! 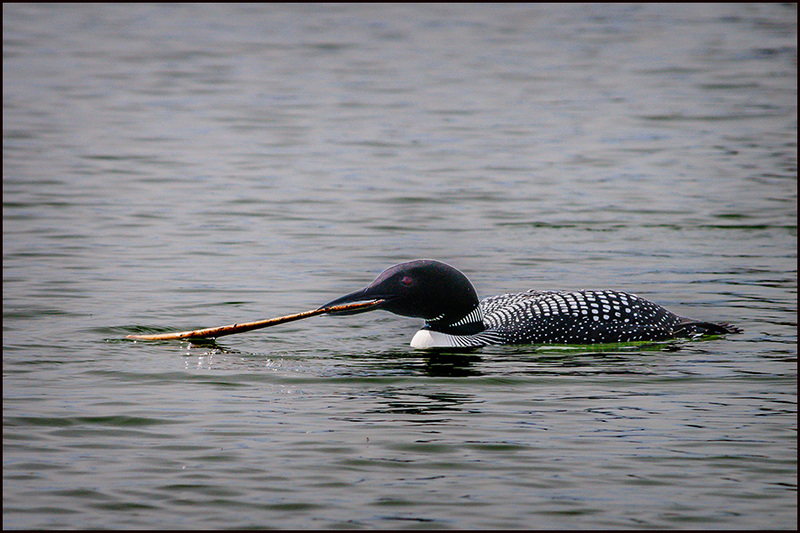 Price: approx. 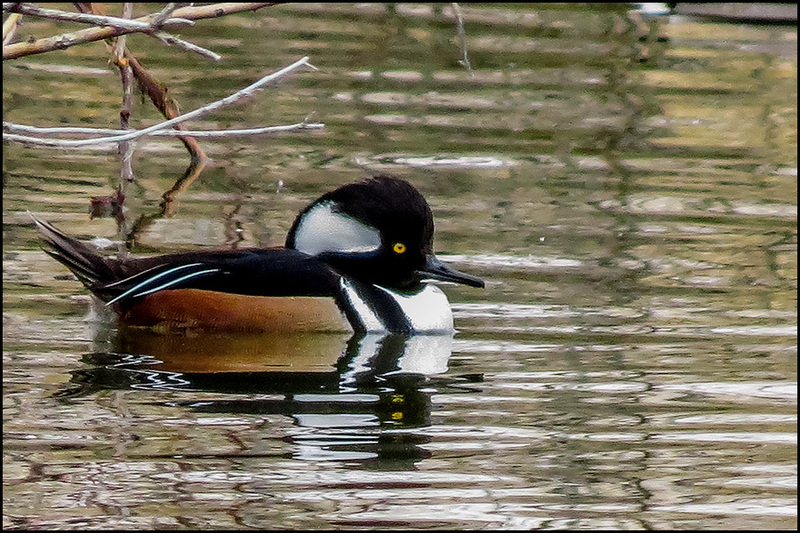 $350... about 1/7 the amount of the Nikon setup! 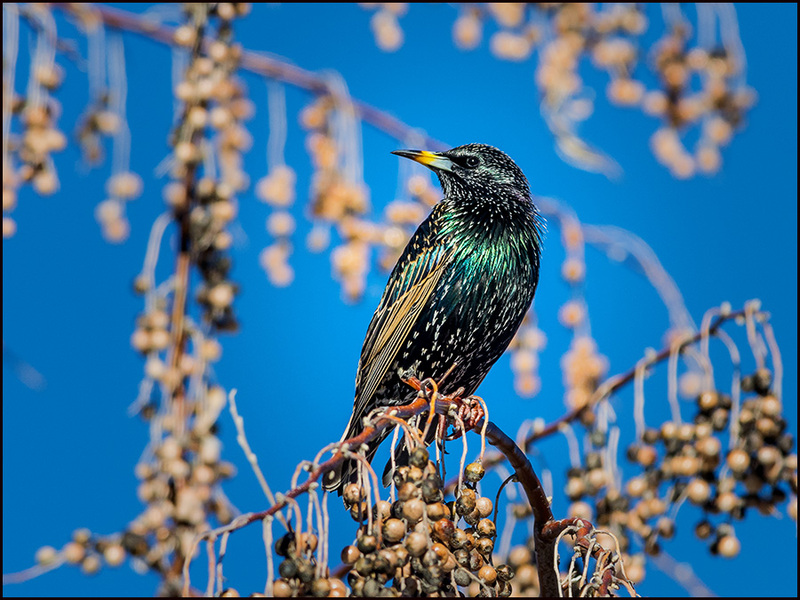 Good light is essential to attain this kind of result; but a computer is NOT ESSENTIAL! 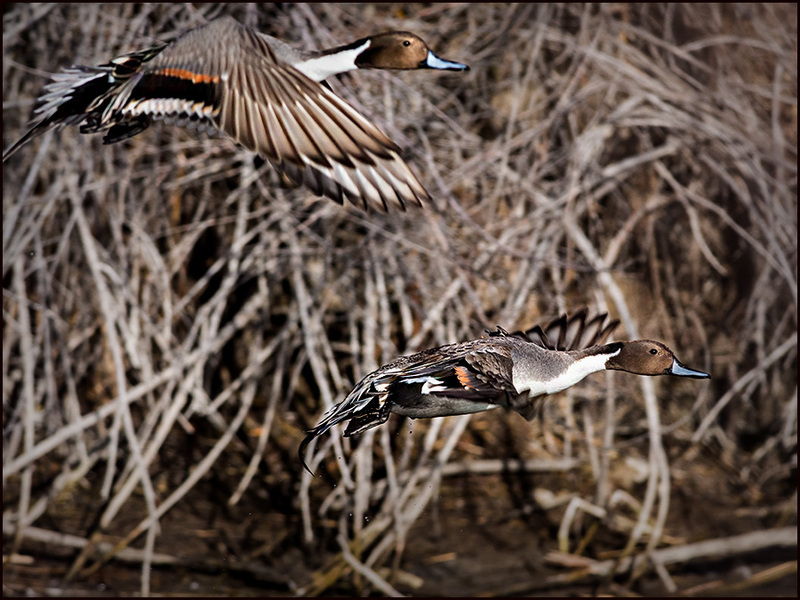 To get results like this requires skill in using the in-camera menu features. 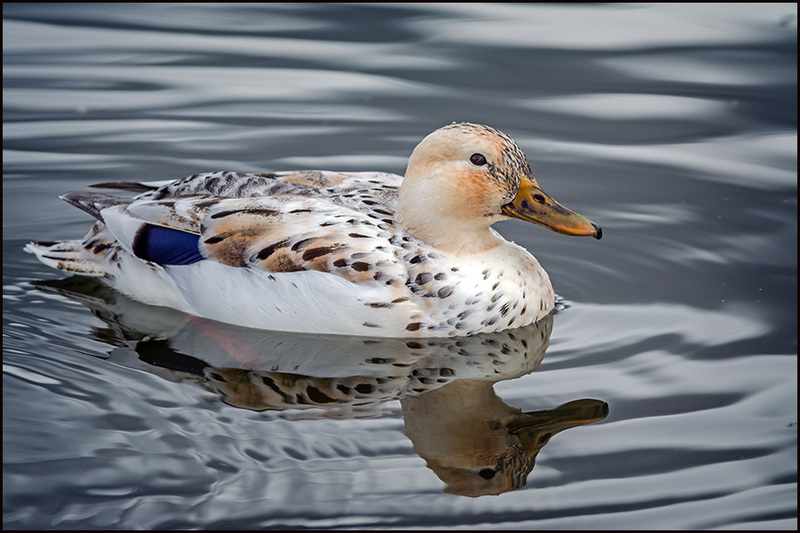 Whatever features one decides upon can be stored and immediately activated via a dial. 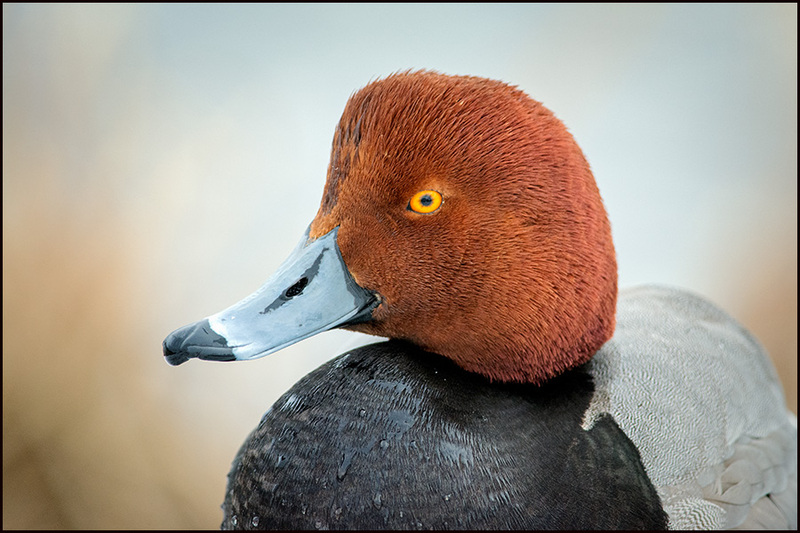 Learning the proper use of the camera is not especially easy; but it's worth the time and effort! 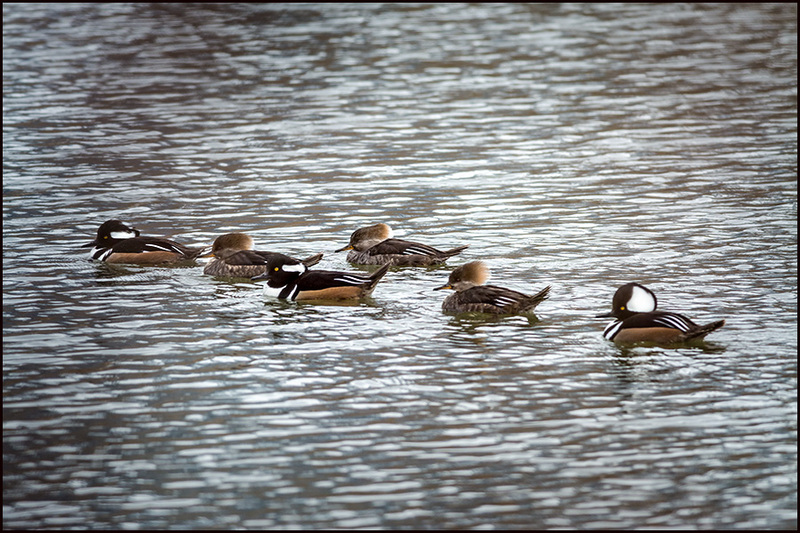 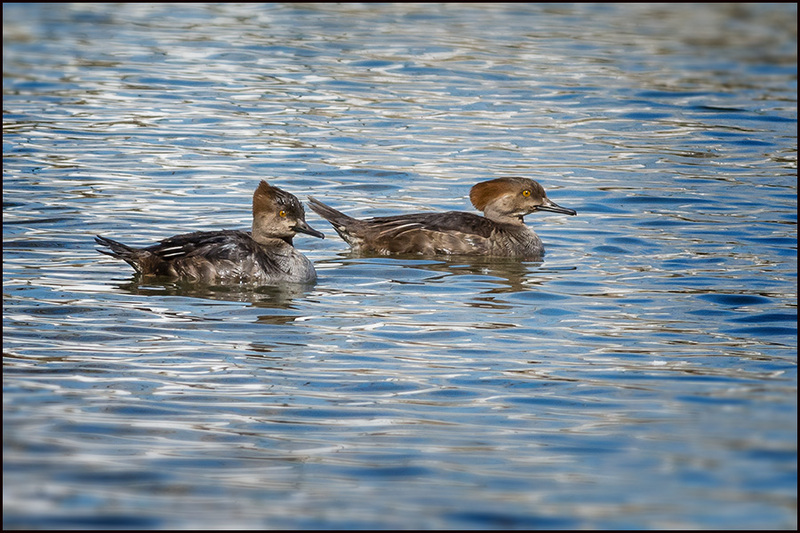 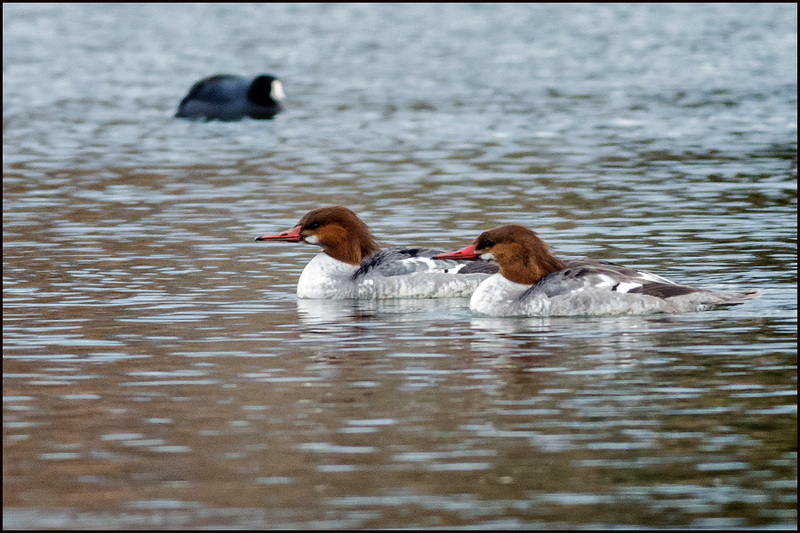 male Common Mergansers at Willow Pond, Murray/Jordan River Parkway, Murray, UT. 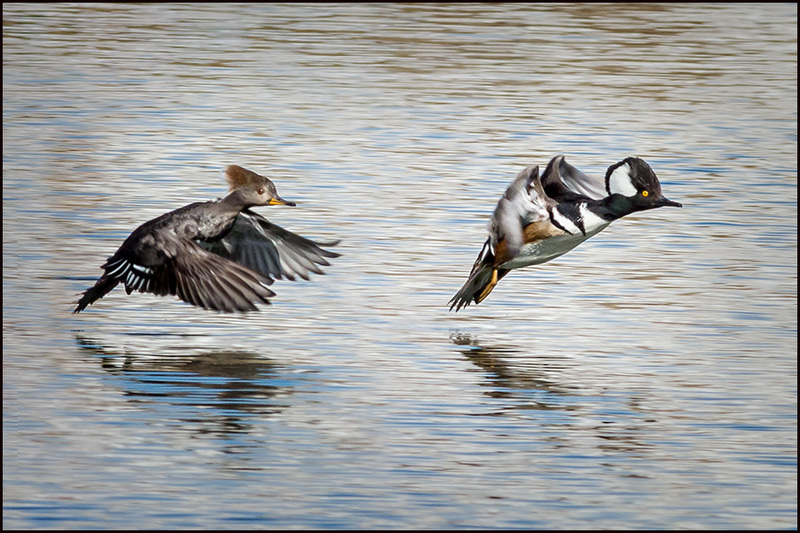 I submit my best of show from that experience here! 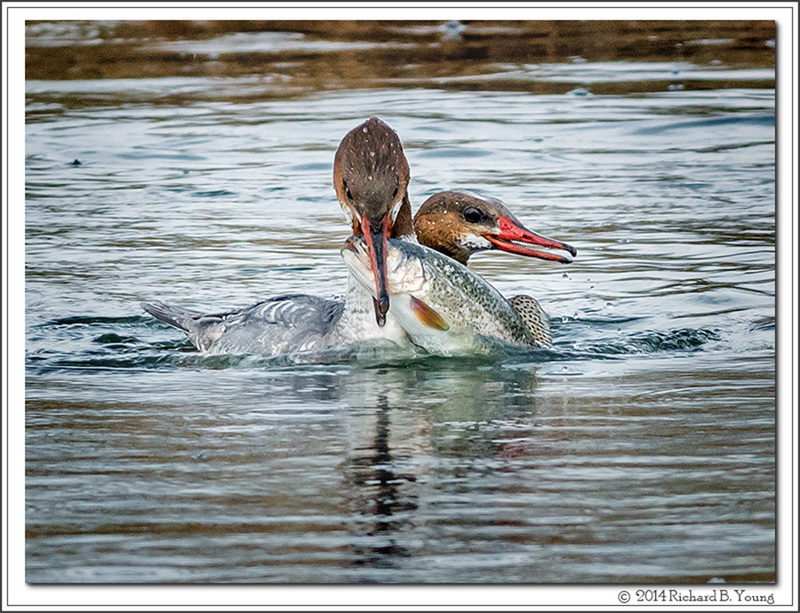 These birds were expert fishers, assisting each other like nothing I had ever seen before! 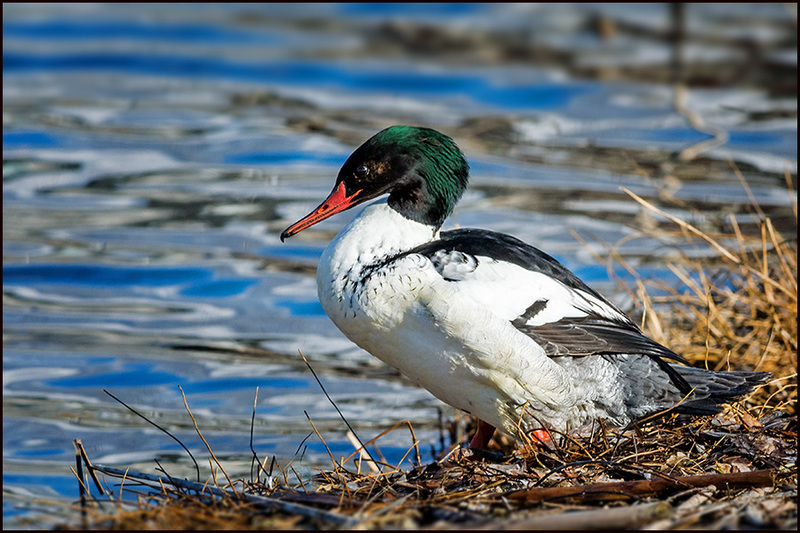 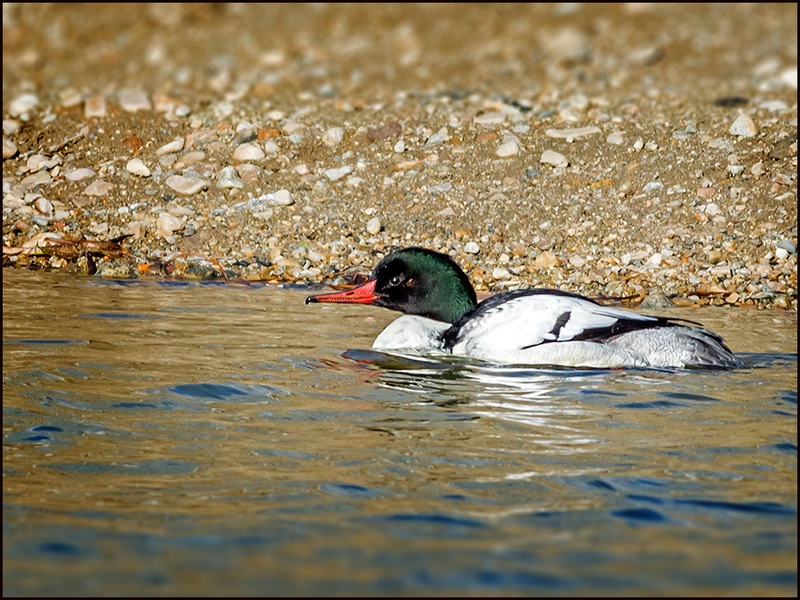 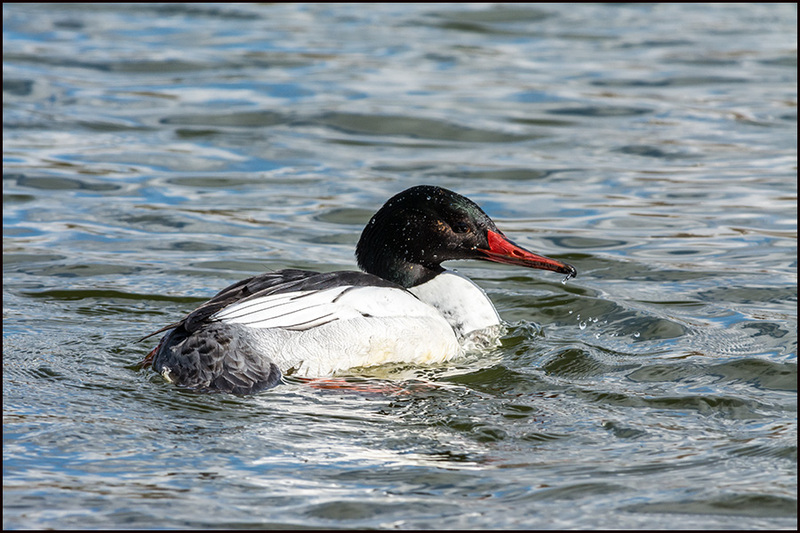 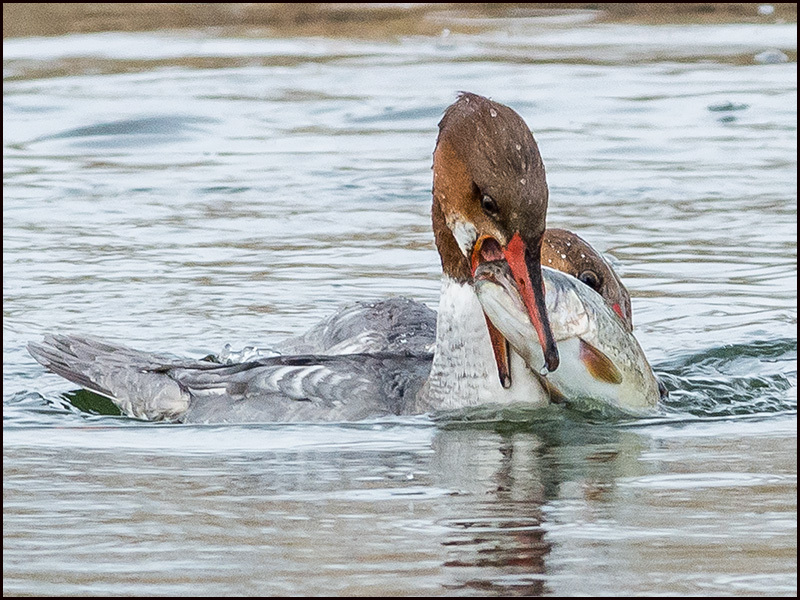 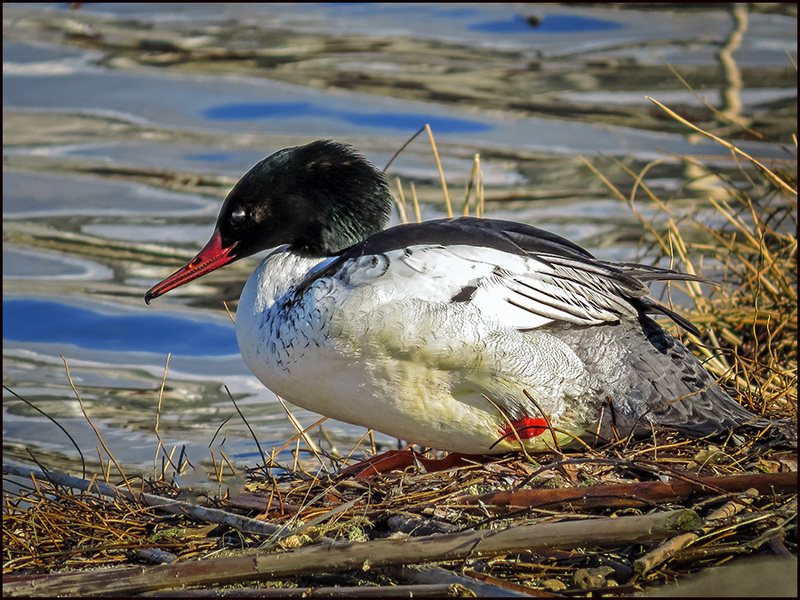 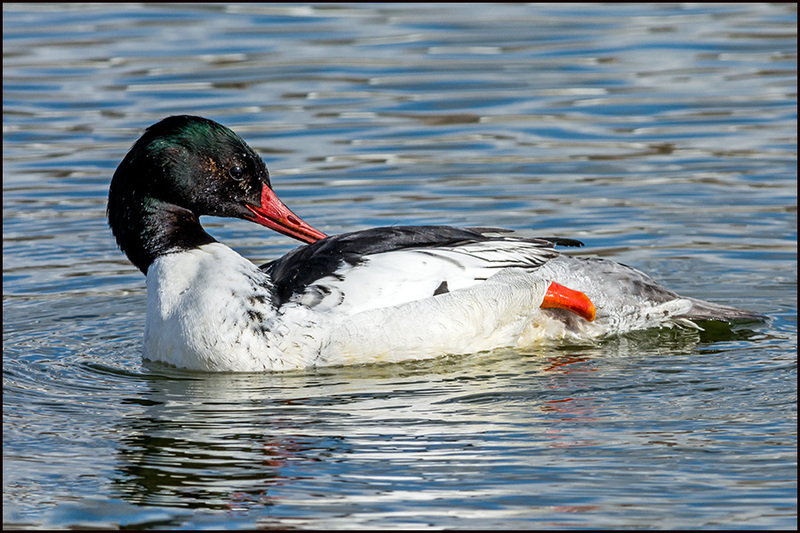 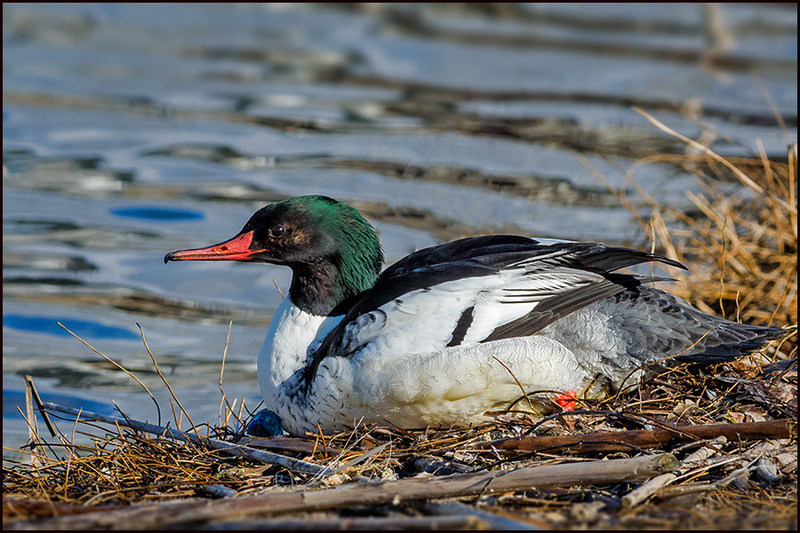 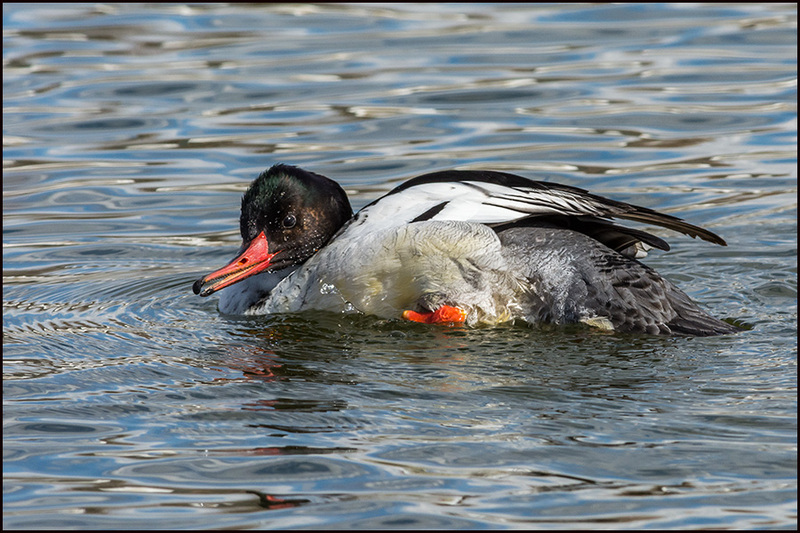 Here is an image demonstrating, on both birds, the 'salt and pepper' white chin patch seen in Common Merganser male dimorphism. 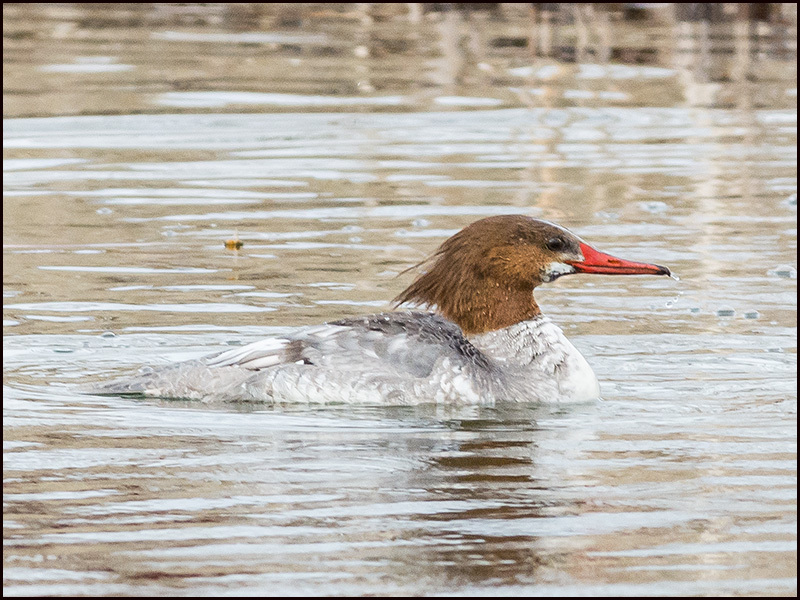 For several days before the appearance of the twins, I was actively photographing this handsome adult male Common Merganser, here seen under diffuse (cloudy) lighting. 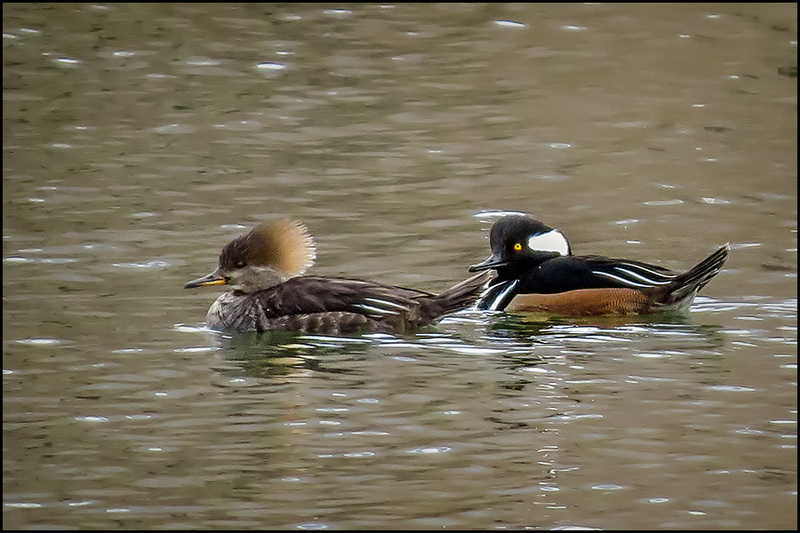 Yesterday, Feb. 13, I encountered these 2 birds and photographed in rain. 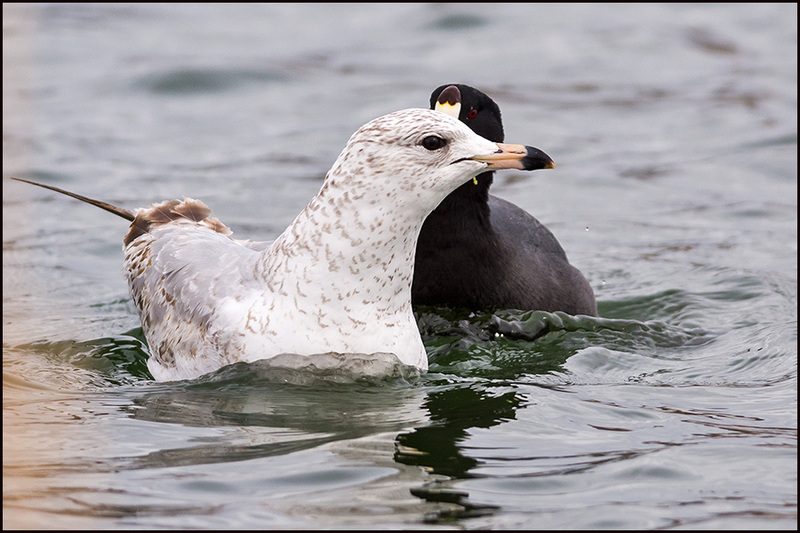 Separate images of the 2 birds, demonstrating their similarities. 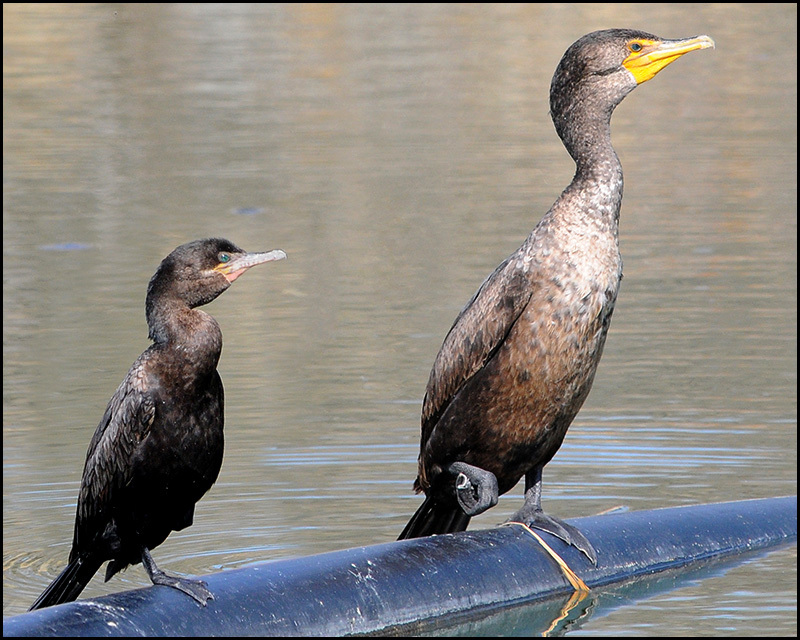 These 2 birds that were extraordinary fishers, gave wide berth to the adult male at all times! 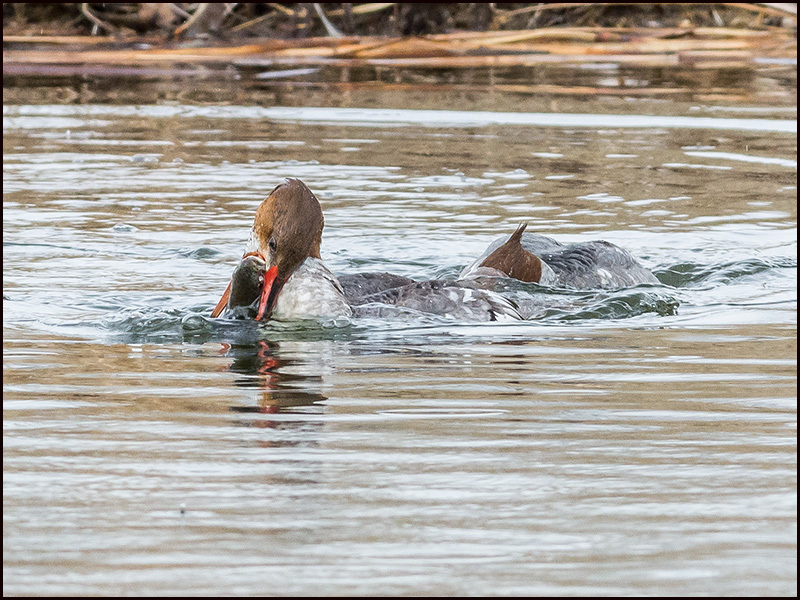 Cruising with their heads barely under water was how they discovered trout. 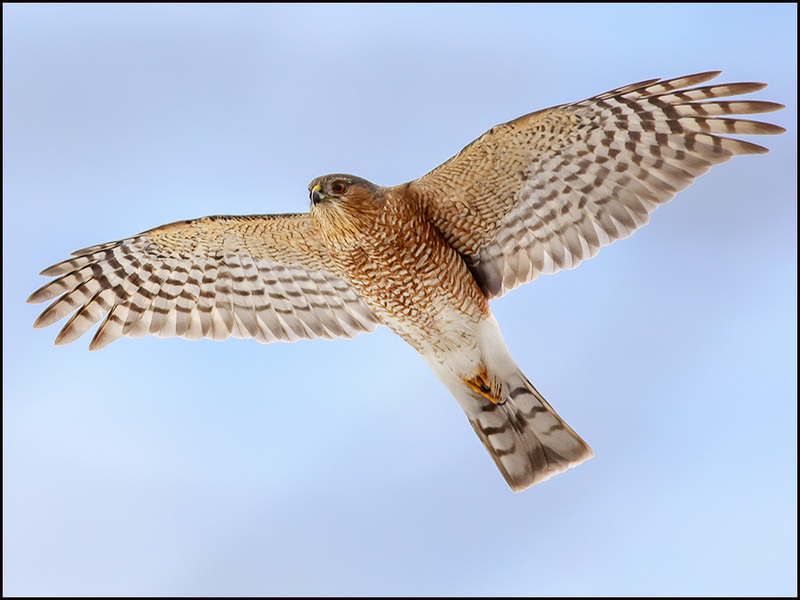 The following series would have made excellent video; but I opted for large still files. 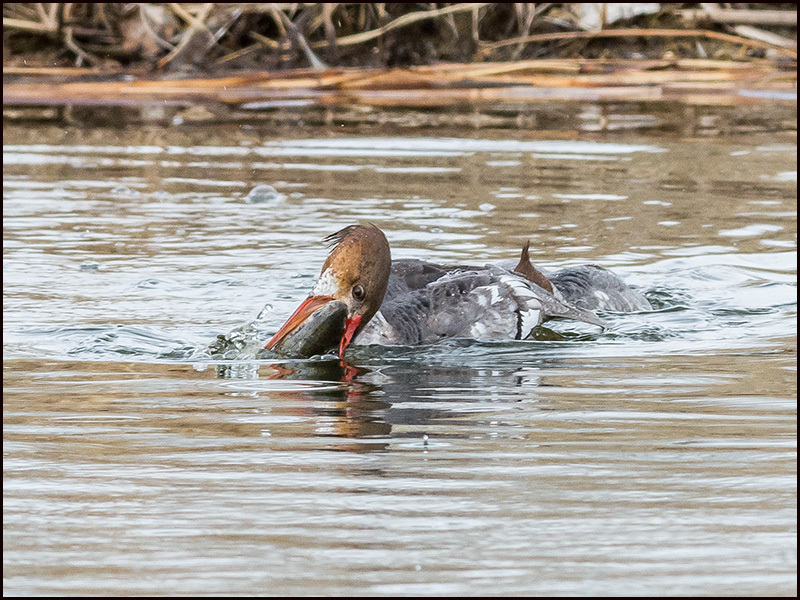 Notice the eye of the 2nd bird behind the fish! 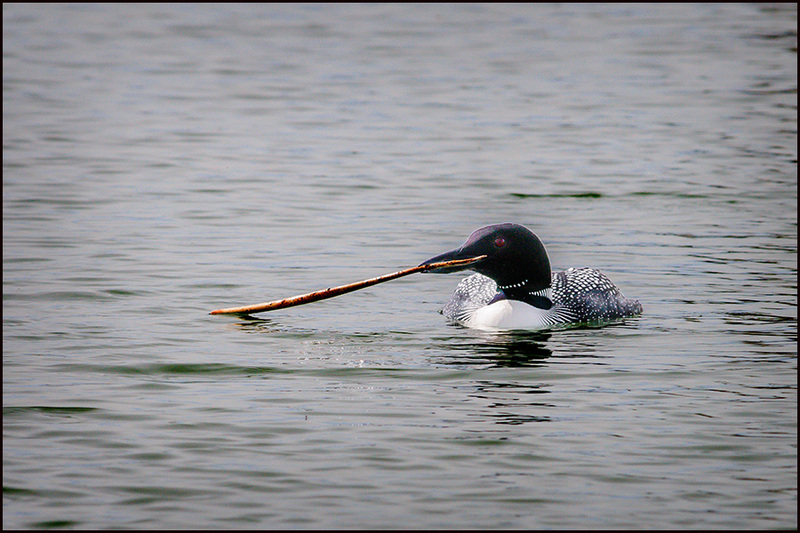 I award myself a prize for this image...! 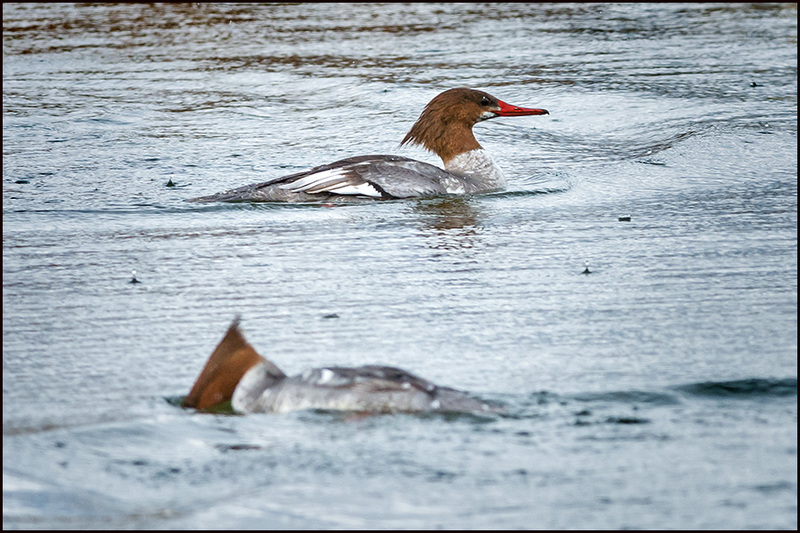 Finishing off my series of Common Mergansers, as the rain began again. 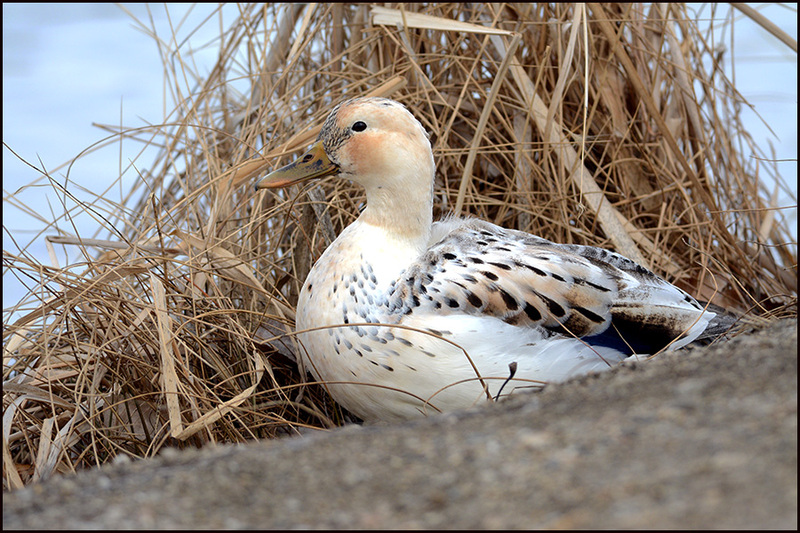 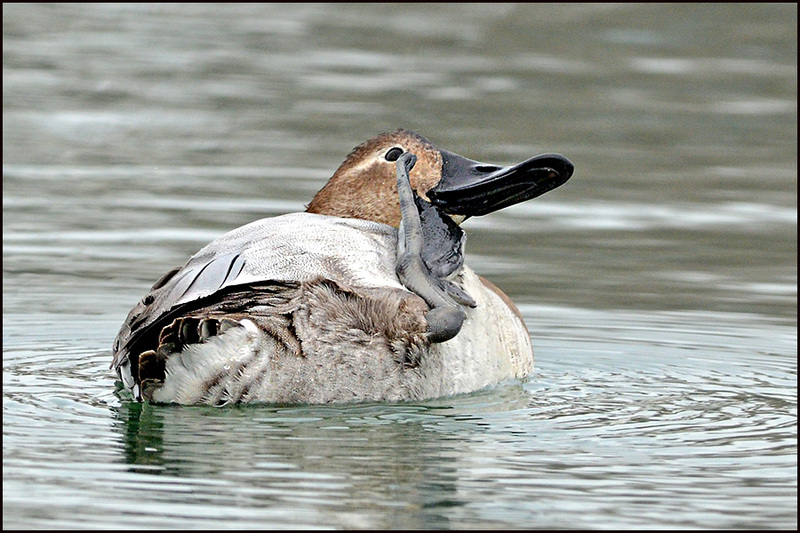 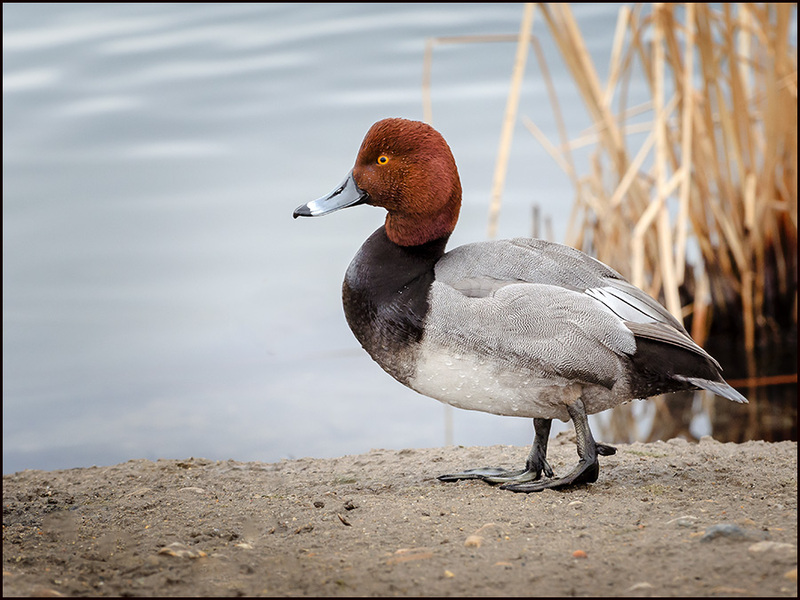 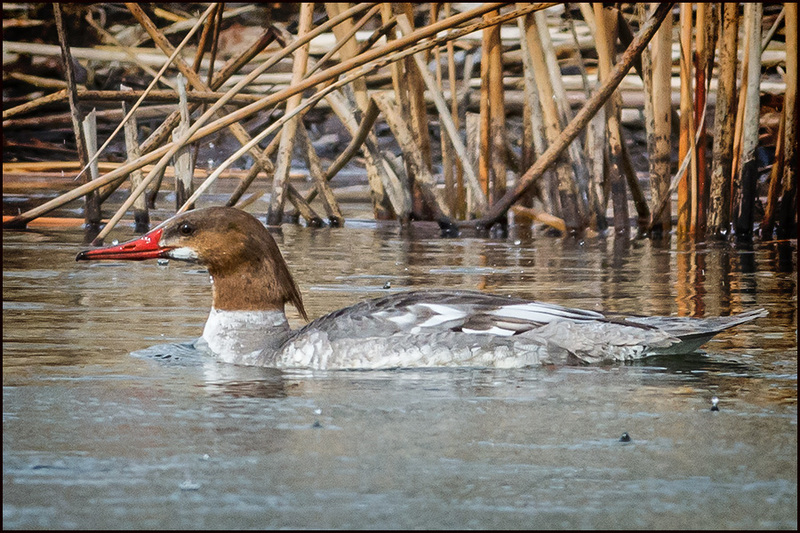 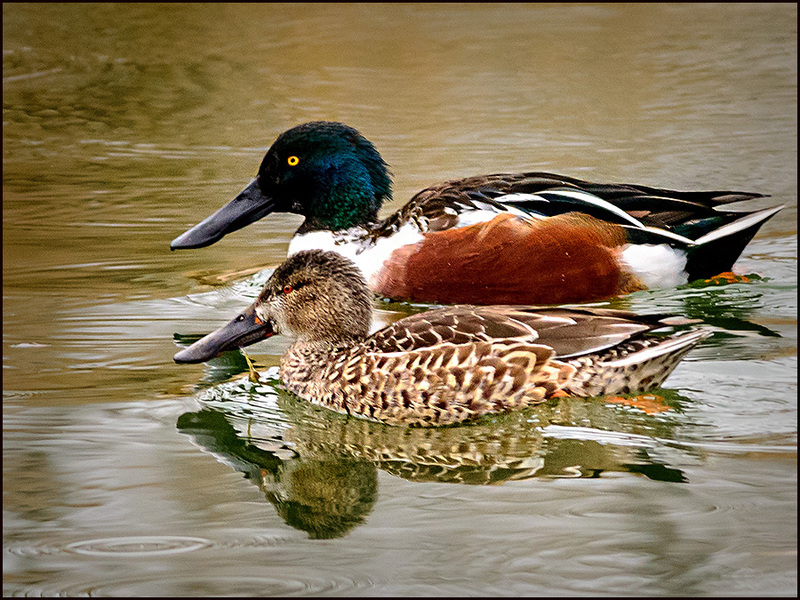 Here's a popular duck that made some press recently, where birders told of their own encounters with this bird at Willow over a considerable span of time. 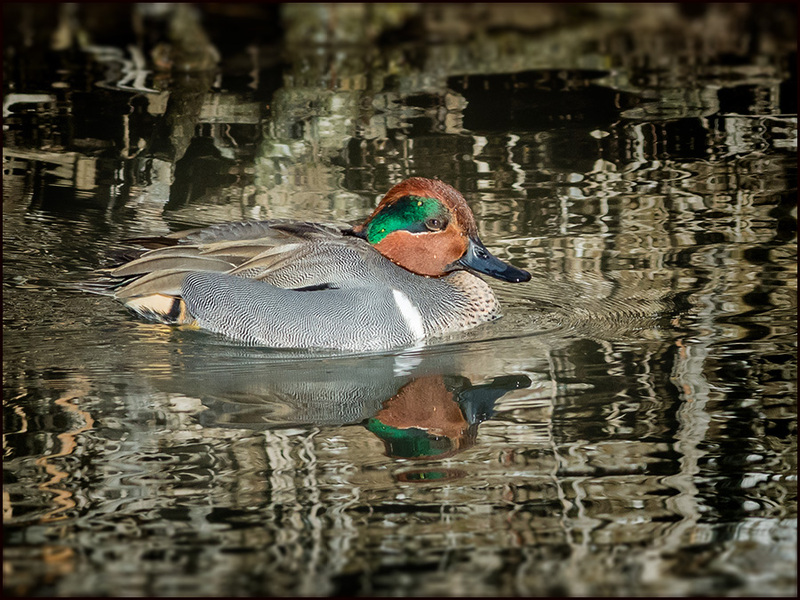 Back at Big Cottonwood Park, things were quiet, with only a few species. 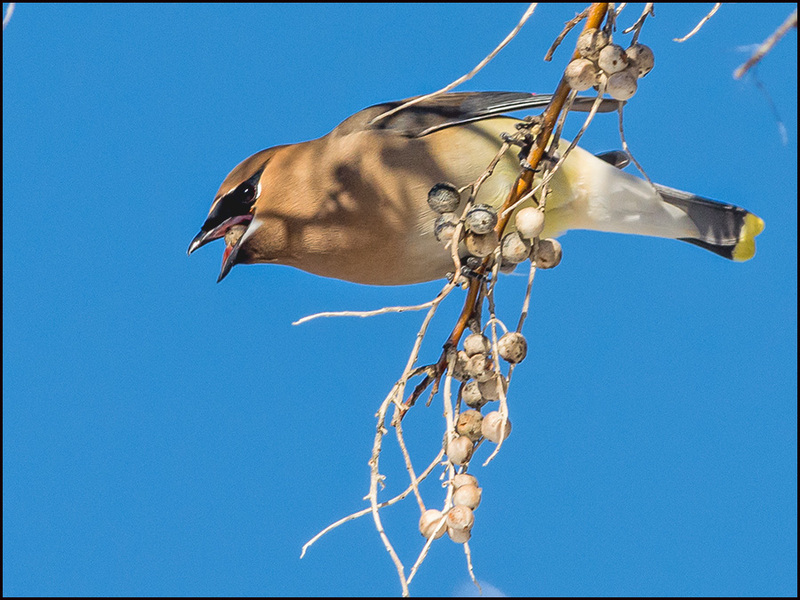 Cedar Waxwing with a Russian olive in its mouth. 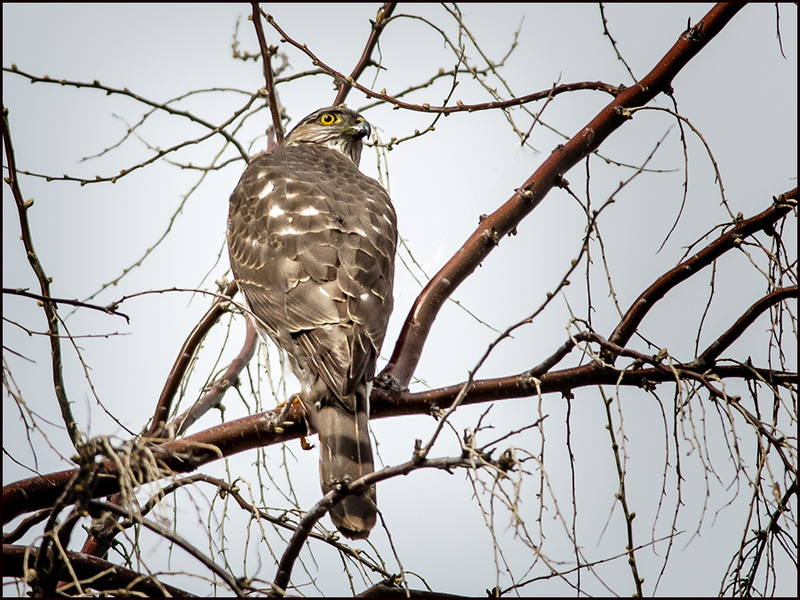 A Cooper's hawk ... at Big Cottonwood. 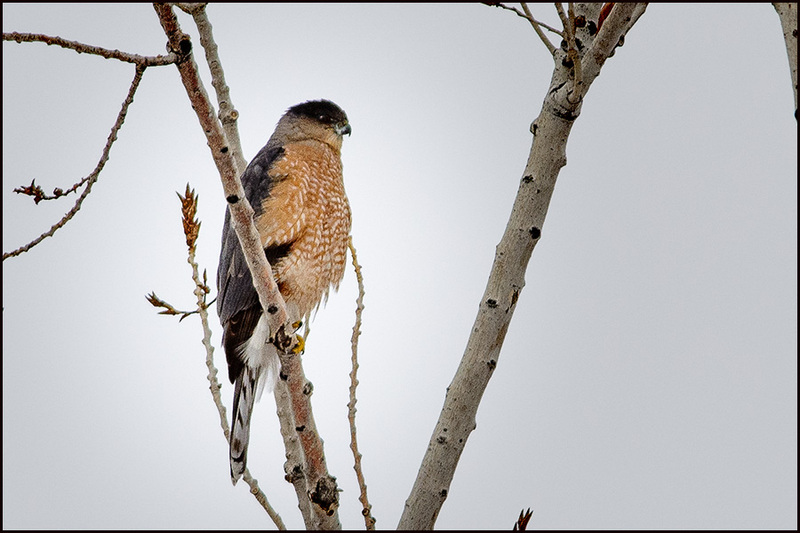 The same day, I located this Sharpshinned hawk. 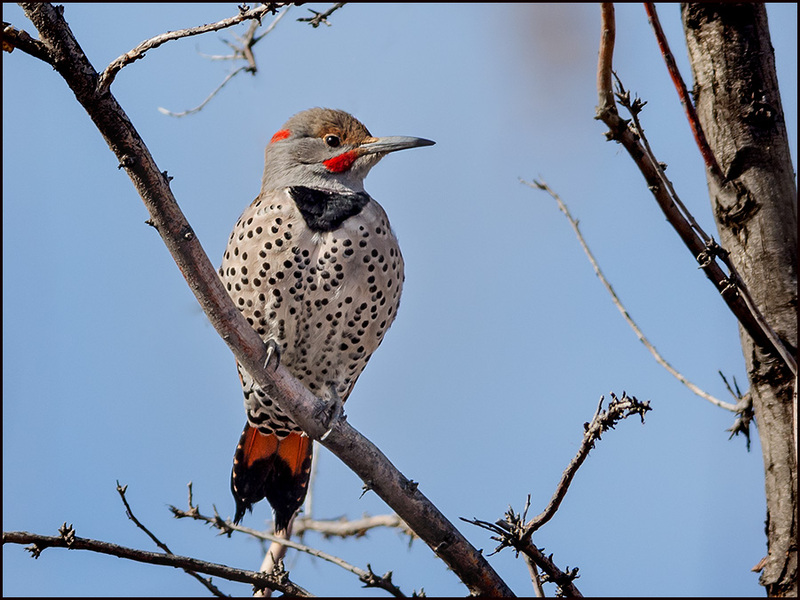 Flicker Intergrades are quite common at Big Cottonwood. 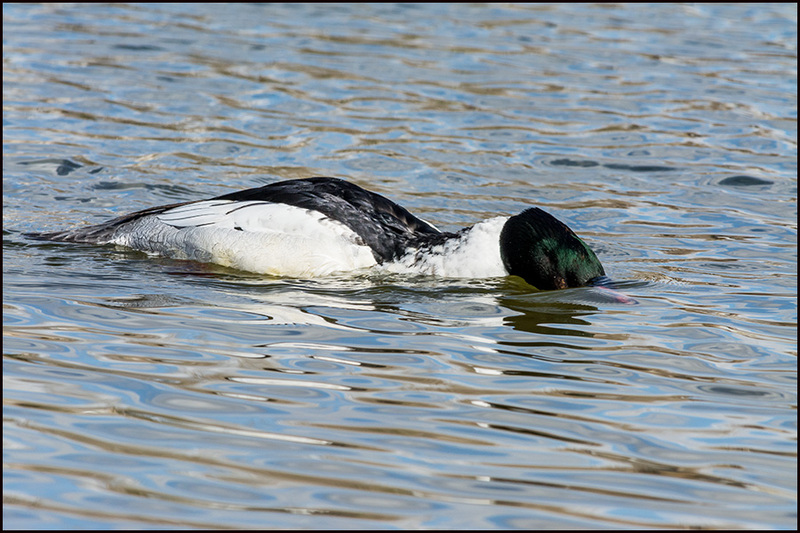 Common Goldeneye challenged me, so I accepted! 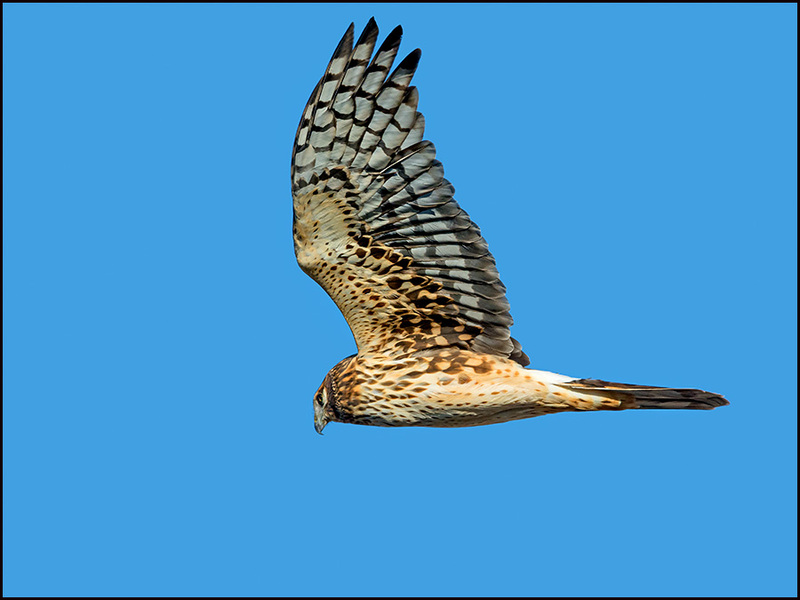 Northern Harriers are seldom seen here this year, in contrast to lots last year! 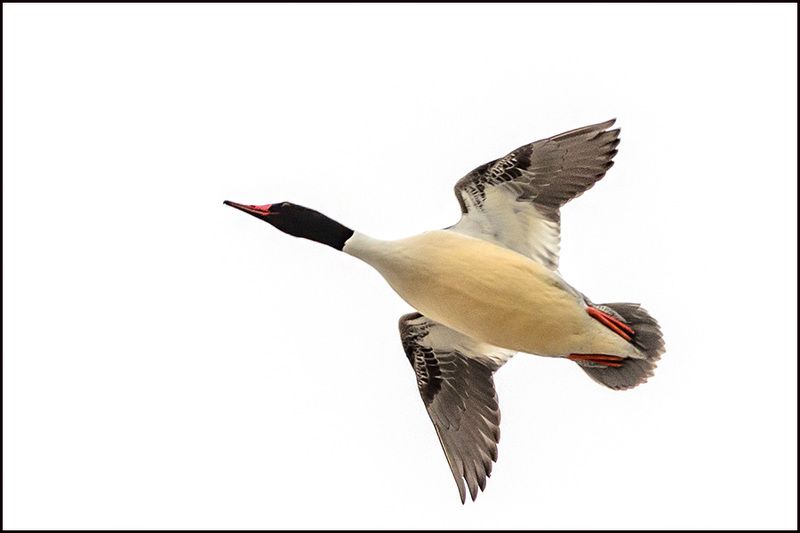 My last BIF for this post... 2 male Northern Pintails feet above the river water. 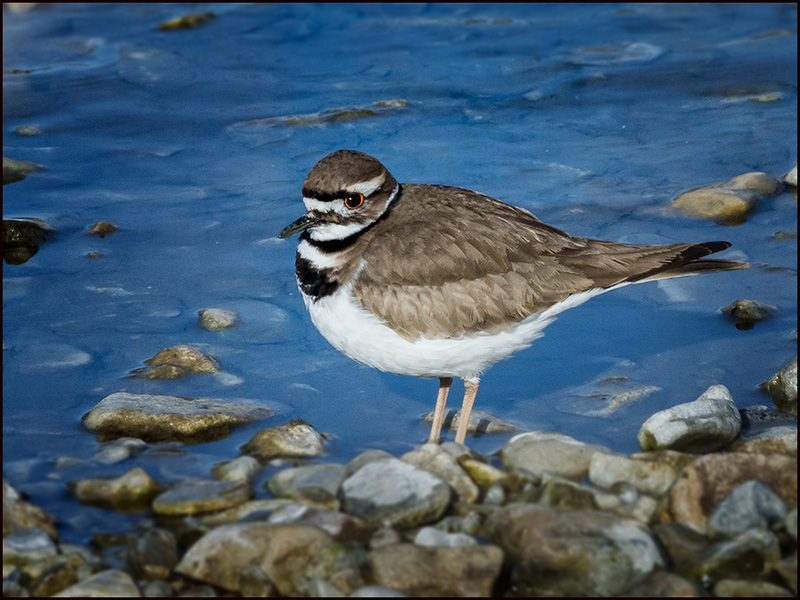 And I was surprised at the discovery of a Killdeer on the river in late January! 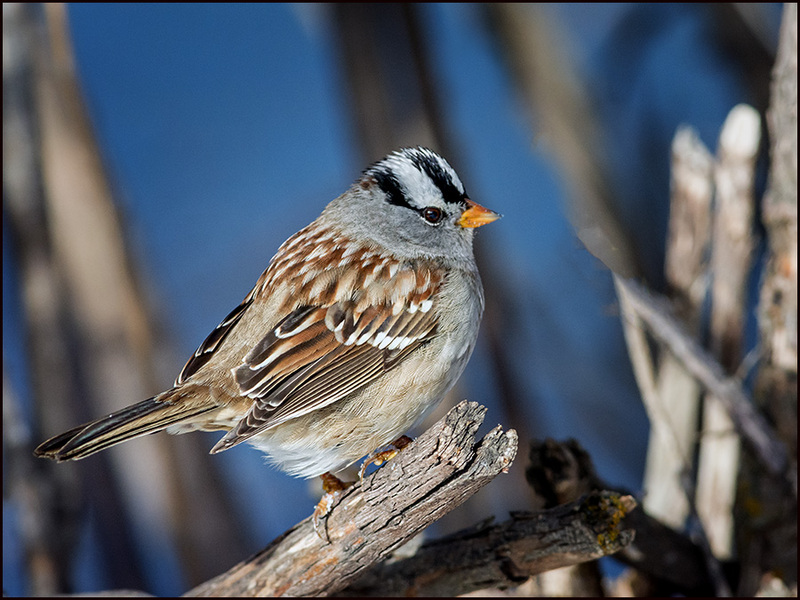 I couldn't pass up this charming White Crowned Sparrow buried in the riverside bushes! 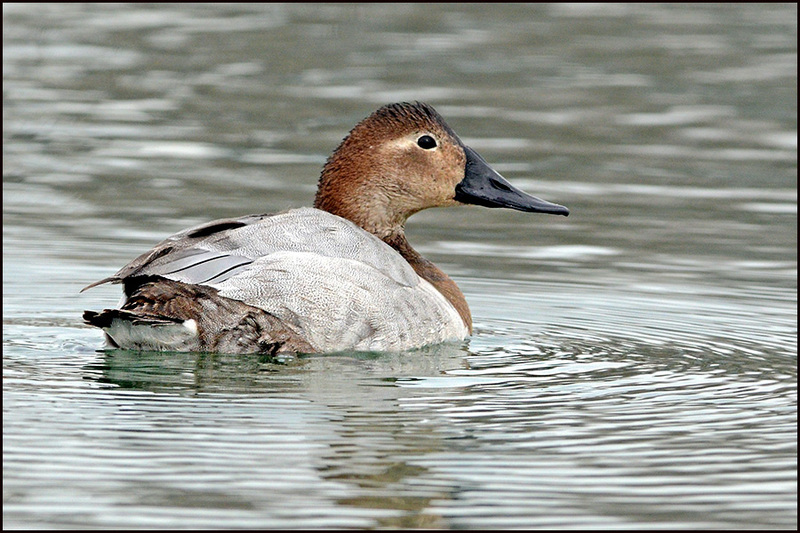 This time of year, Greenwing Teal are common there. 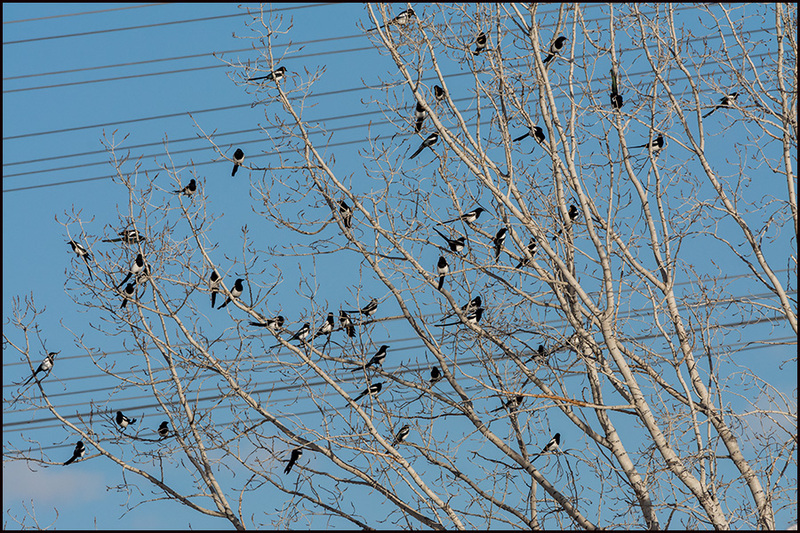 This tree was 1 of 3, loaded with Black-billed Magpies on the golf course north of Sandy Pond, along with dozens that were airborne! 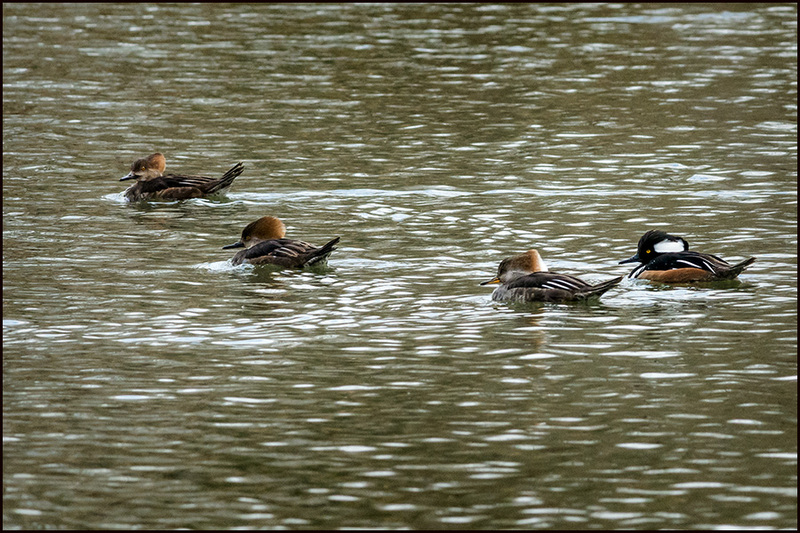 I've never seen so many in one place. 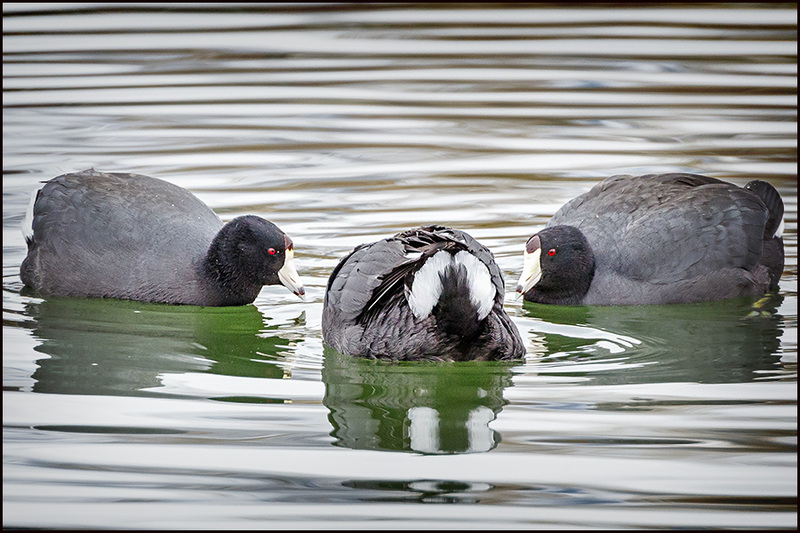 This image is just shy of 50 birds! 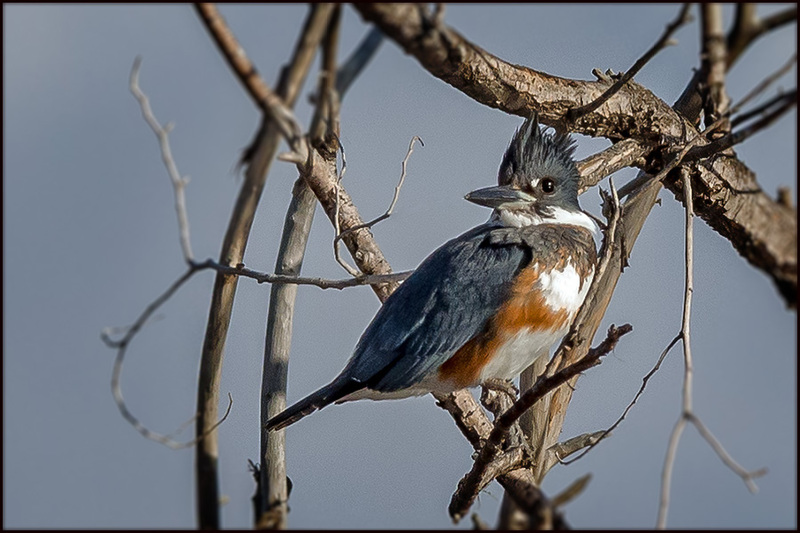 And, finally I saw my FOY Belted Kingfisher there!